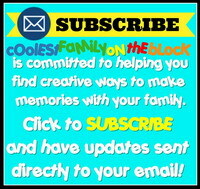 (Email and feed readers click here or click through to the blog to view the video. These festivals are held on the same weekend every year and I always have hopes of being able to visit them both on the same day, but it’s just impossible. 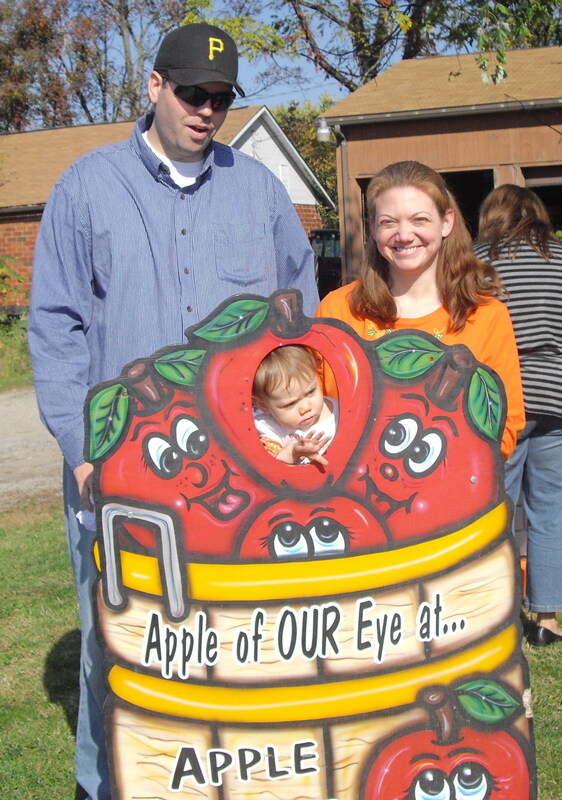 Last year we attended the Apple Festival first and then drove to Volant only to find that it was so packed there were no parking spaces (and Adaline fell asleep in the car anyway). The year before that we went to Volant late in the day. This year we decided to start with Volant. We arrived right at the start of the festival and were able to find a parking space. Then we headed right for Volant Mills. There was a cute little boy sitting there on the porch just as friendly as could be saying, “Hi girl!” to Adaline, but she was not interested. It’s nice to see she’s as friendly as I am (good work, Mom). 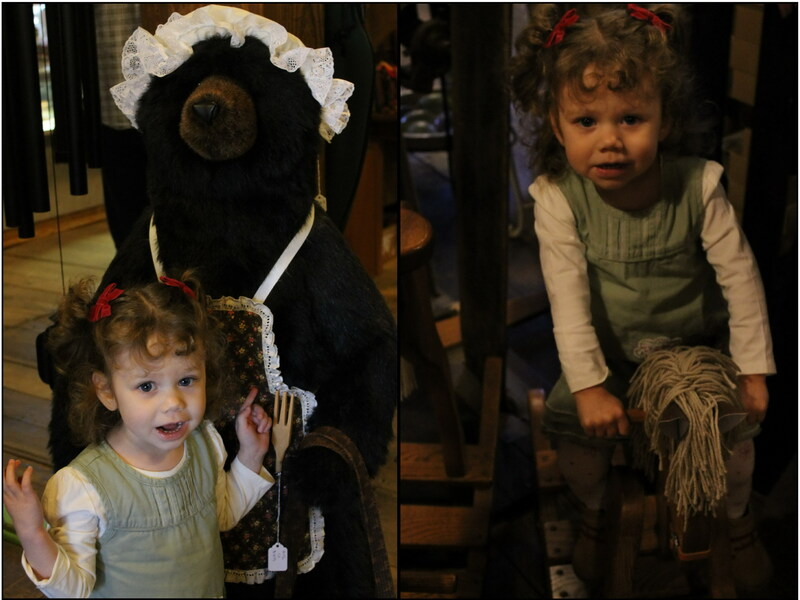 Adaline loved finding all of the bears inside the store and riding on the rocking horse. 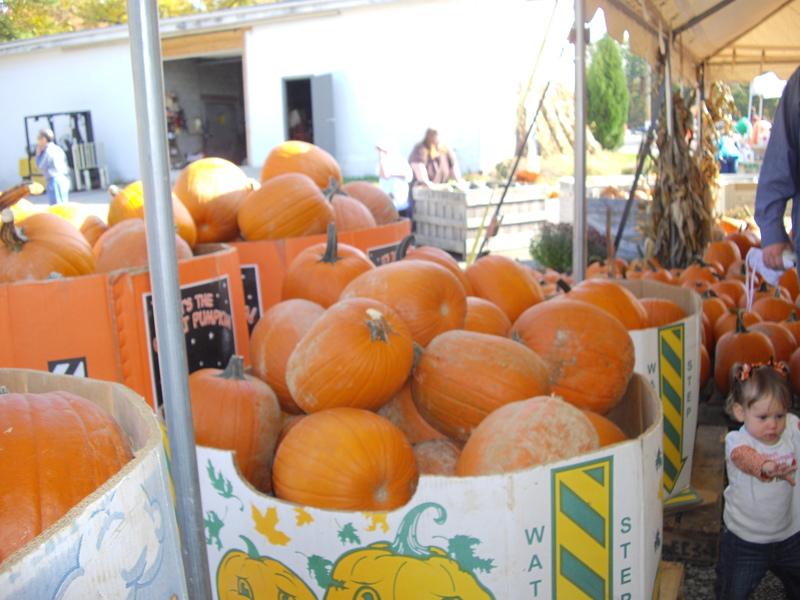 Next we stopped and looked at pumpkins but we didn’t pick one out since we didn’t want to carry it around with us. 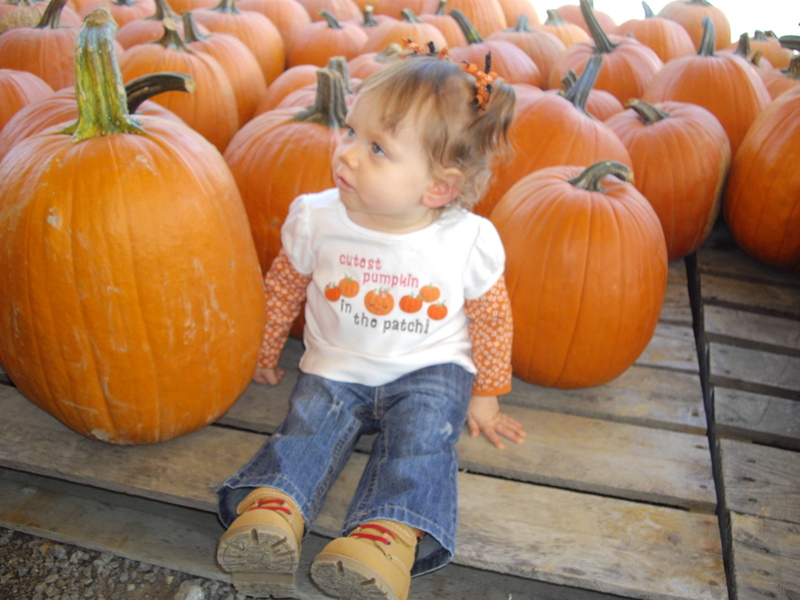 After all of the pumpkin peeking we decided to go visit all of the shops locating past the mill. While we walked past the giant water wheel right next to the busy street and almost to the parking lot busy with cars pulling in and out Adaline decides she doesn’t want to hold my hand anymore and starts to struggle. Naturally there wasn’t time to explain to her that she needed to hold my hand and since desperately clinging to her arm as she tried to get away wasn’t working…I decided to pick her up and drag her across the parking lot. That’s no small feat for this 5 foot mama with a 2 year old half her size and a pregnant belly taking up all of the space. Adaline gave a real good kicking and screaming fit, “I wanna walk! I no hold hands!”. 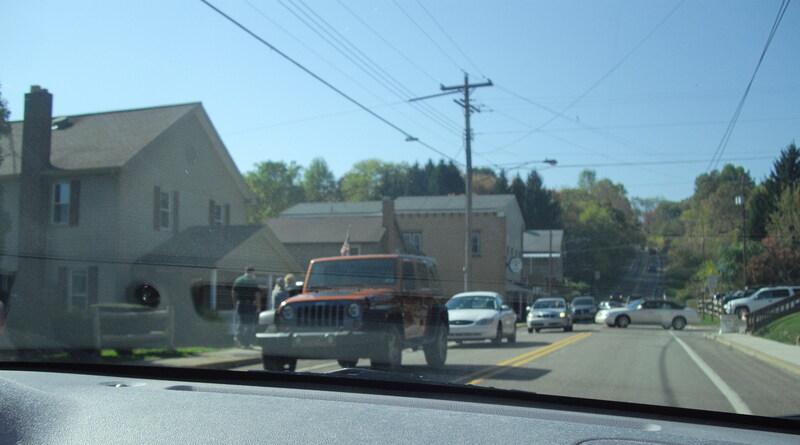 Oh, and there were about 50 people standing in line to get Amish donuts that got to witness the whole thing. I wrestled her over to the front porch of the closest store where I distracted her with a skeleton on display by getting her to sing, ” ‘Dem bones, ‘dem bones they walk around.” Once she calmed down I explained to her that she needed to hold onto my hand or Muggy’s hand when we’re outside and when we’re inside she can walk by herself. Thankfully after that we had no trouble and she held our hand every time we left a store and stayed right with us inside all of the shops. So there, judgmental onlookers…take that! We went from store to store and everyone said how cute Adaline is (they didn’t witness the great parking lot tantrum of 2011). Sometimes she was friendly and other times not so much (“I’m not cute!”). She seemed to enjoy window shopping and would look at the stuff and then say, “Let’s go to another store!” in an excited voice. She really loved it when a store was playing music and sometimes didn’t want to leave. Since it had been about 3 hours and I had somehow managed not to pee my pants I headed off to the bathroom. The one that I found was a single bathroom down a hallway, you’re supposed to wait outside of the hallway to give the others privacy. In front of me there was a family (Mom, Dad, and two little girls) who were taking turns using the bathroom. When Dad was in there mom came out with the girls and apologized when she saw my pregnant belly saying she knows how that is. I told her it’s no problem and that I’m used to holding it (although not for 3 hours, but she was only responsible for about 10min of that). Then all of the sudden this girl comes walking up, who looked to be my age and didn’t look pregnant, looked right at me and said, “Can I go first?” Now she did have a sense of urgency in her voice, but still…I’m pregnant. I might’ve considered it if she were elderly, or a mom with a little one, or if I flat out just wasn’t pregnant…but I am. So I told her, “I’m sorry, no. I’ve been holding it for 3 hours and when he gets out I’m going in.” And that’s exactly what happened. I made quick work of it and I apologized to her when I got out (not sure why considering I was there first…and I’m pregnant!). Ya know, having other people let you go to the bathroom first and hold open the door for you and give you their seat is part of the perks of pregnancy and apparently, I just wasn’t willing to give that up. 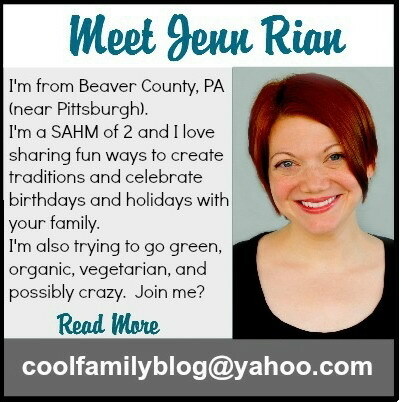 Selfish Jenn. Selfish pregnant Jenn. So once I got to pee and we had looked in all of the shops (yet refrained from buying anything) we were hungry. 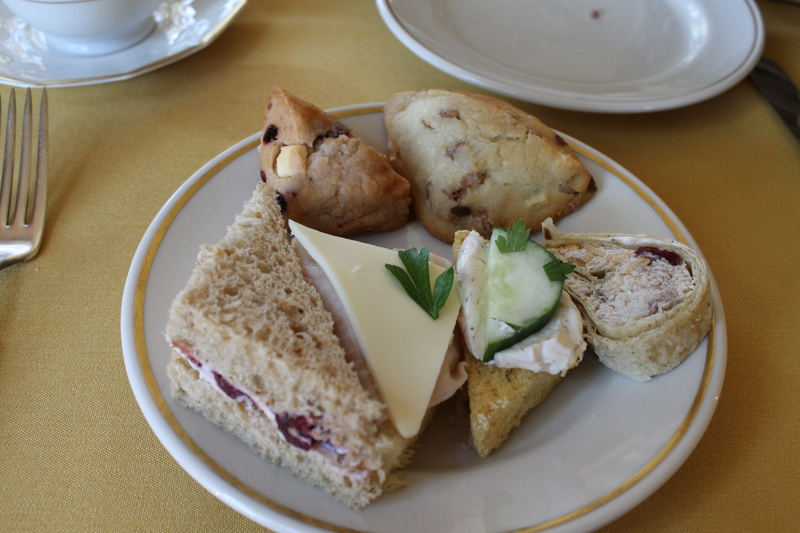 I had read online that they were going to be having a “Fancy Fall Tea” at The Meeting House, so we headed over there. Well, actually she did more purposely dropping silverware on the floor, running to look out of the window, and saying, “The nice lady will be right back.” every time the waitress left the table rather than actually having tea. But it still counts. 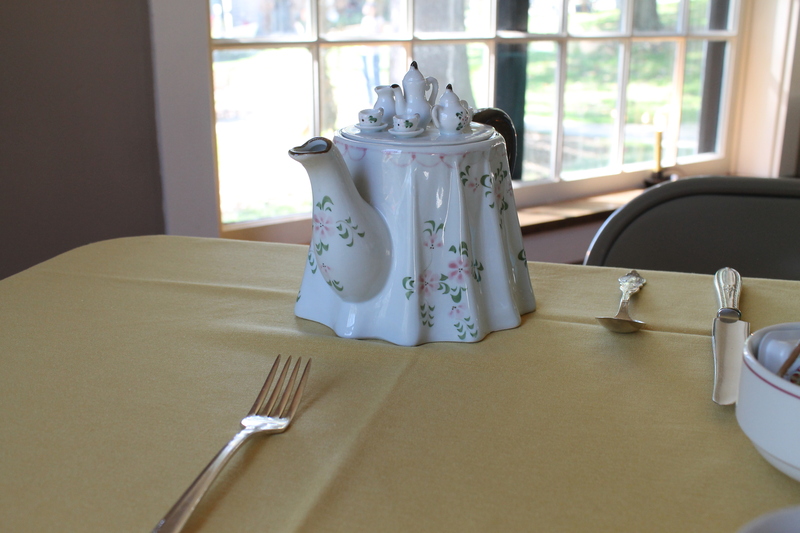 Our cute little tea pot for our table. After another visit at the window Adaline walked up to the end of the table and with big tears in her eyes and a sad voice she said, “I’m alright.” I said, “Oh honey, what’s the matter? !” to which she replied, “I touched the candle!” and burst into tears. 😦 Poor little thing. It was an electric candle, but it was hot from being plugged in all day. We got her some ice and she was fine. 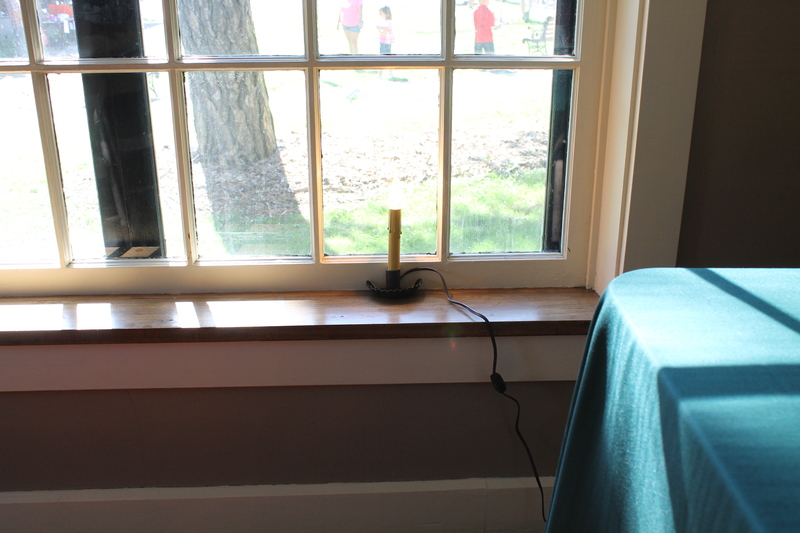 Here is infamous candle. The chocolately mouth-print had already been wiped off by my mother (forgive her, she doesn’t understand yet that in the blogging world one must take photos of every little detail!). Luckily for us there was only one lady sitting in a corner by herself sipping tea (without the sandwiches) so we had the whole place to ourselves to let the 2 year old run amuck in the tea room, throw silverware on the floor for fun, wipe her dirty mouth on the window, and burn herself. We brought a lot of ambiance to the place. Well, if we weren’t distracting enough there were all of the passersby that would walk into the tea room see us sitting only a few feet from the door eating and drinking tea, proceed to walk around the corner going, “What is this, a tea room? Is this a shop? What is this?” to which my mom and I would reply, “Yes, it’s just a little tea room.” and then they’d mumble to themselves about how this used to be a store (an art store if they were knowledgeable) and then leave. This happened countless times. I’m not sure why everyone was so confused. When they walked in and saw my mom and I sitting at a table covered in linens and china and eating food…what did they think was going on? Did they think this was a store and we just happened to bring our own lunch, complete with tea set, and just start eating in the middle of the shop? 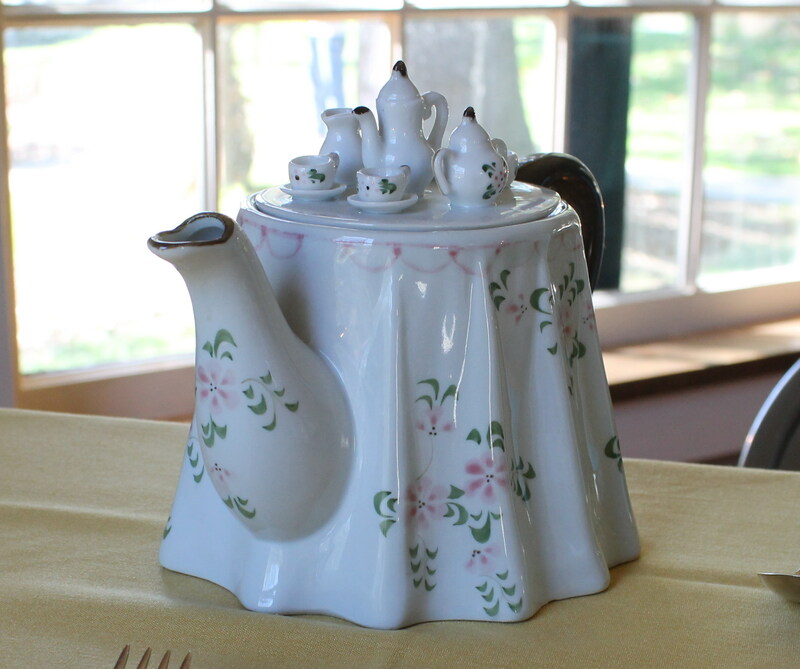 One lady even walked up to our table (without acknowledging us) and picked up our tea pot and said to her friend, “Look at how cute this tea pot is!” There was no price tag on the tea pot. Our table was in front of a window and the tea pot was on the side of the table opposite from where the entrance was…so this lady had to walk behind my mom’s chair and pass her to the other side of the table directly across from where I was sitting and eating so that she could manhandle our tea pot. When she left I called after her, “Wait a minute! You forgot to stick your finger in the clotted cream!” Even with the chocolate mouth print on the window and the silverware on the floor we might’ve been the classiest people there. While I didn’t get any photos of the layout inside, I did snap a picture before we went into the tea room and I put notes all over it to help you get a good visual. 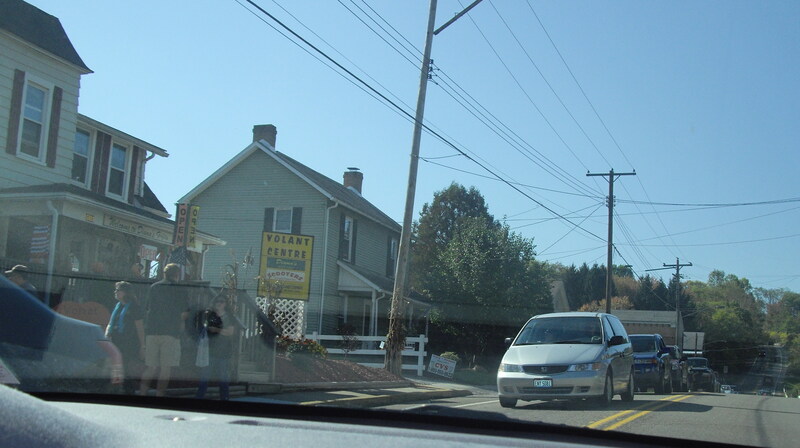 It was time to leave Volant and I was hoping that we’d make it to the Apple Festival. 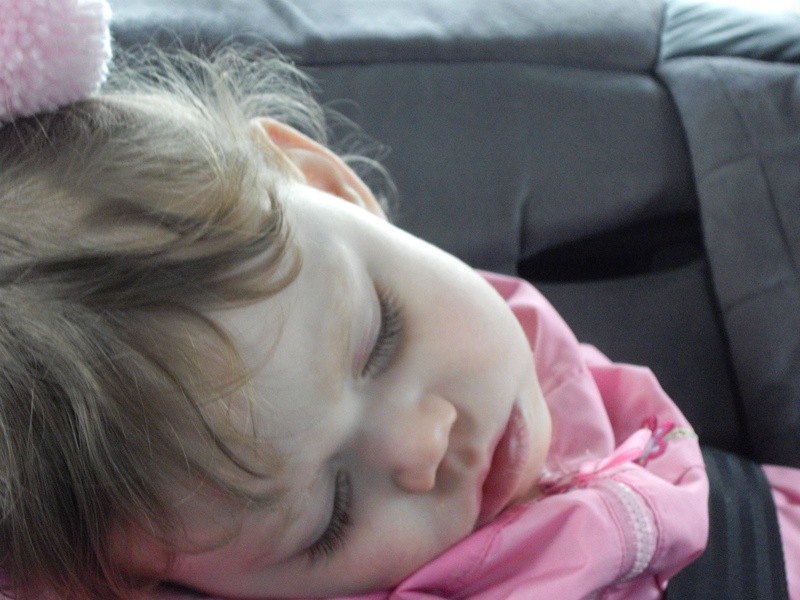 About 2 minutes before we got there Adaline fell asleep in the car. We wouldn’t have been able to go anyway because by this point (3pm) it was a sea of people and had we attempted to go we would’ve been miserable. We went home. My only purchases for the day were Amish made bread and apple butter which I treated myself to on Sunday evening. 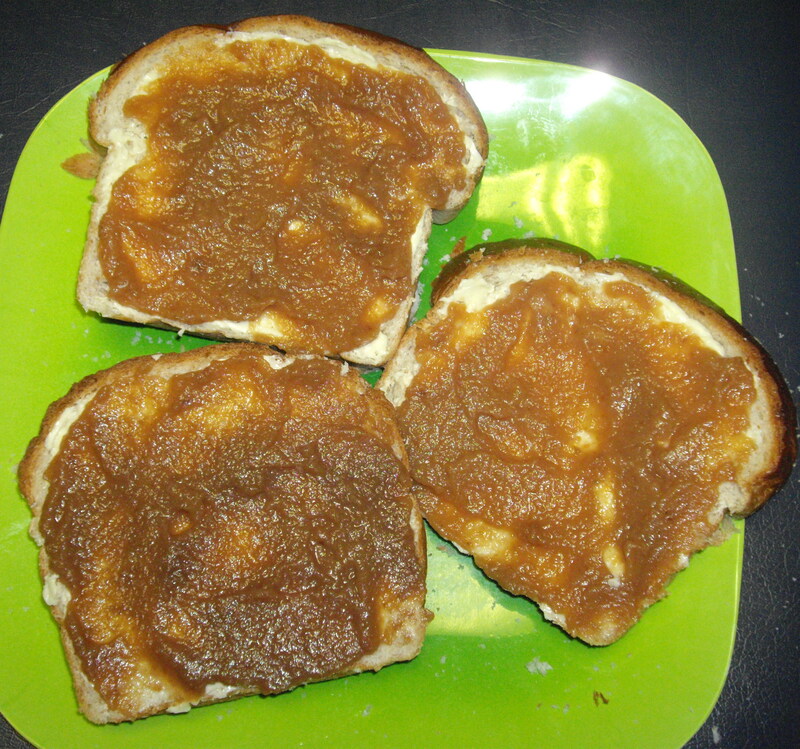 It was sooo good and I used almost the entire jar of apple butter on those 3 slices of bread. We’ll definitely make a trip to the Apple Castle sometime even though there won’t be a festival going on. I wonder which festival we’ll decide to attend next year…Volant or Apple Castle? 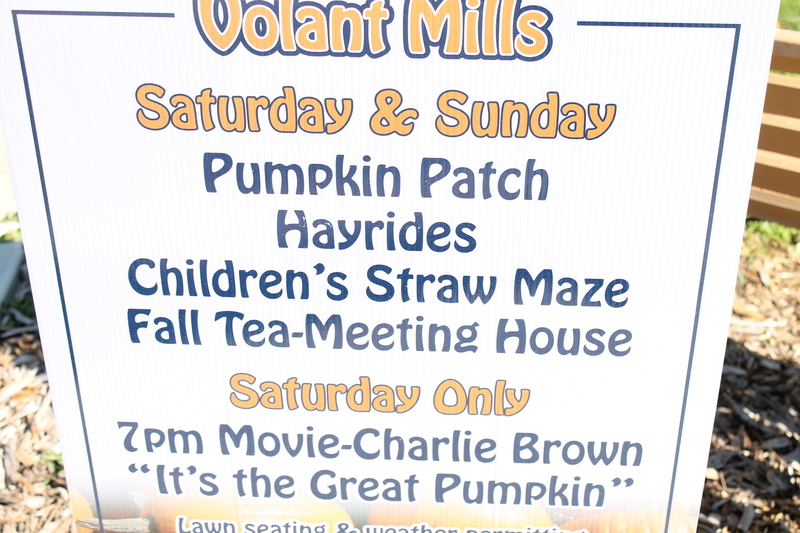 Have you attended the Volant Pumpkin Festival before? Please tell me in the comments section. Who knew there was so much to do in Beaver County?! 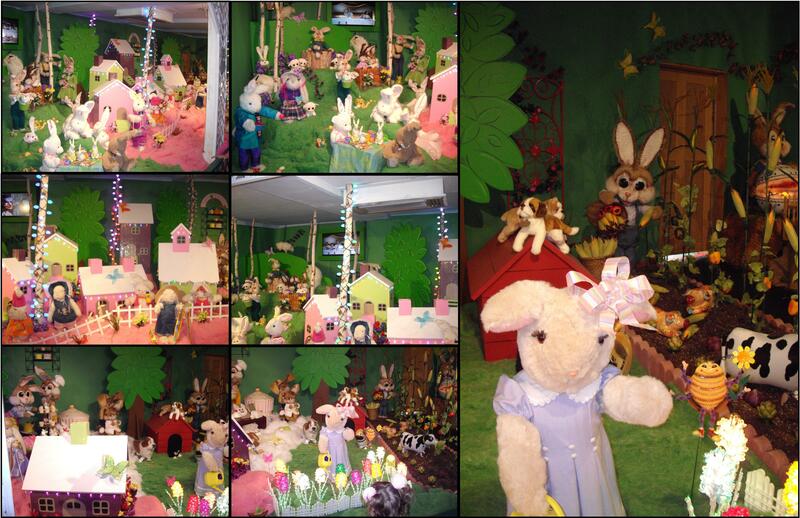 On Saturday we planned on traveling out to Volant for their various Easter festivities and also stopping by Kraynak’s in Hermitage, PA to see Bunnylane. It was raining quite a bit in our neck of the woods so we decided to drive out to Kraynak’s anyway since it’s an indoor activity and we’d stop by Volant if it dried up. It seemed like quite a far drive just to see Bunnylane. 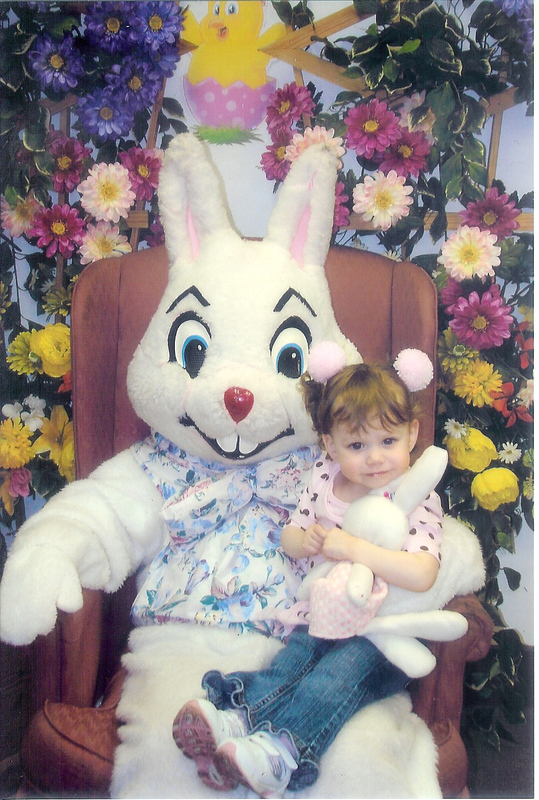 I was just hoping that meeting the Easter Bunny wouldn’t be as traumatic as our last trip to Kraynak’s to meet Santa and then again at the mall. Well. A few weeks ago my mom and I drove out to Boardman, OH with Adaline and she fussed the entire ride there “up, out, down” (yippy). Thankfully she was a perfect angel during the trip to Kraynak’s. Not only did she not fuss, but she even did a little “dancing” in her car seat (these are the thrilling details here, people, try to stay awake). When we got to Kraynak’s we found one glorious available space in the front parking lot (yippy for real this time). It was still raining so Daddy rushed the little princess into the store as fast as he could. They were both still wet. Both of their hoods flew off during the sprint. When I finished attempting to dry off my family I had a really awesome view straight up Adaline’s nose since her Daddy was holding her and he’s 6’3 and I’m 5’1 (there goes those details again). I could see an entire family of dried kangaroos up there, and this is unacceptable, so I started picking at the poor dear in the middle of the store. She hated it and the people came by and took my Mother of the Year Award away. I’m not sure exactly what time we arrived there, with all of the excitement from the rain and the boogers I forgot to check my watch (which would actually be my cell phone since I don’t wear a watch and you wanted to know this because, that’s right, you love the details), but it must’ve been the perfect time because there wasn’t a gigantic line for Bunnylane. We went right into Bunnylane and Daddy walked Adaline around while I busied myself taking videos and photos of every precious second. 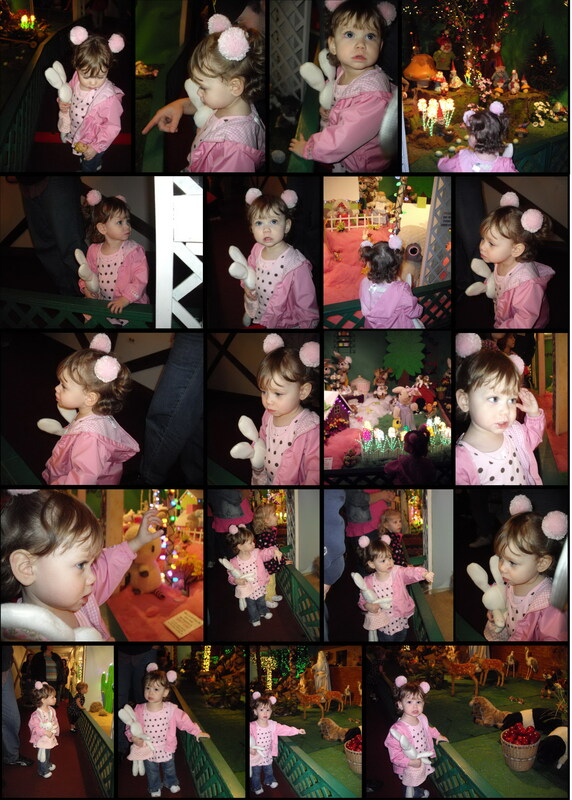 Here are 20 photos of Adaline looking at displays. 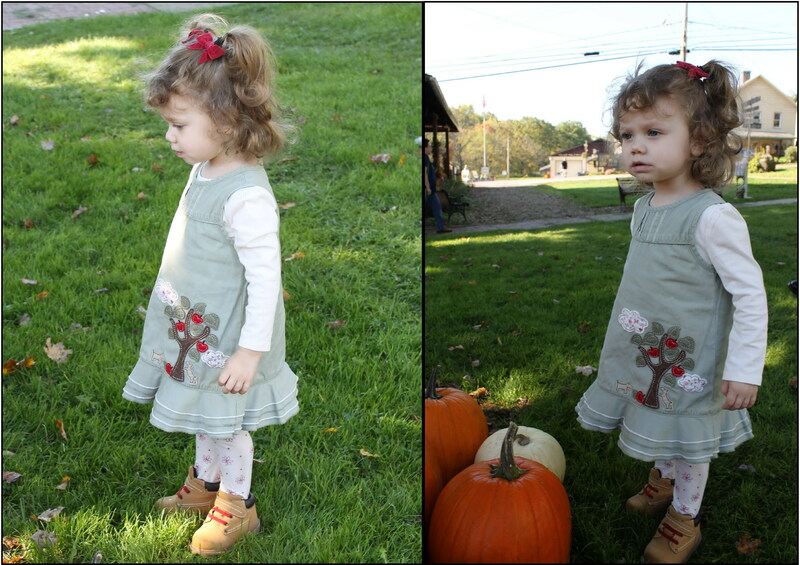 They are probably too small to see but when it comes to picking out photos of Adaline I am chronically indecisive. I’m certain that everyone wants to see her sweet little face from every.possible.angle. You are welcome. 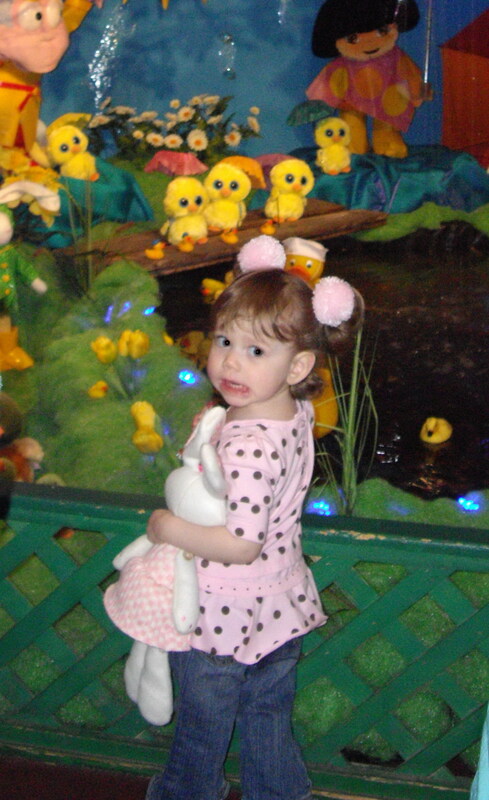 The first display was the duckies and Adaline loved it. The song about “the one little duck with the feather on its back” was playing over and over. She didn’t want to leave that display, but eventually we got her to move on to the bees and the gnomes. 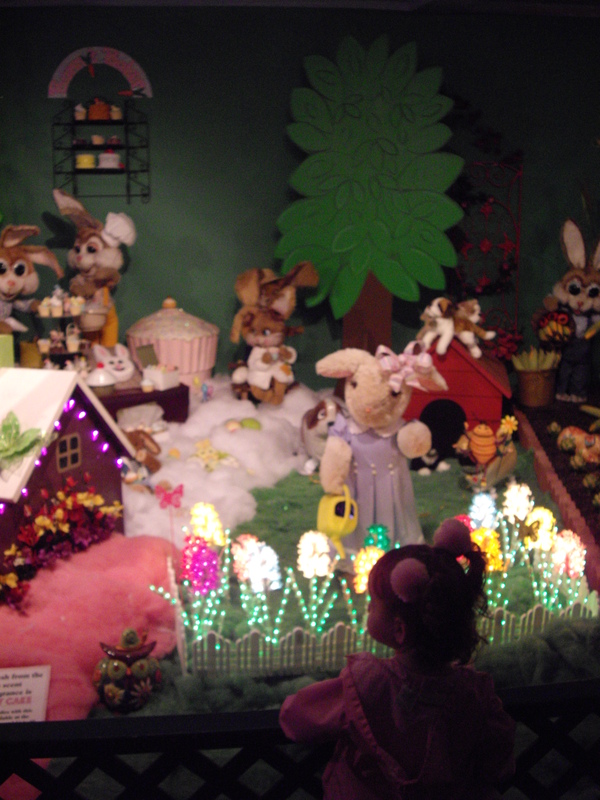 The bunny display had a tv with The Lonely Goatherd from The Sound of Music playing over and over. Adaline gave us a little shimmy, but wouldn’t let me catch it on camera. 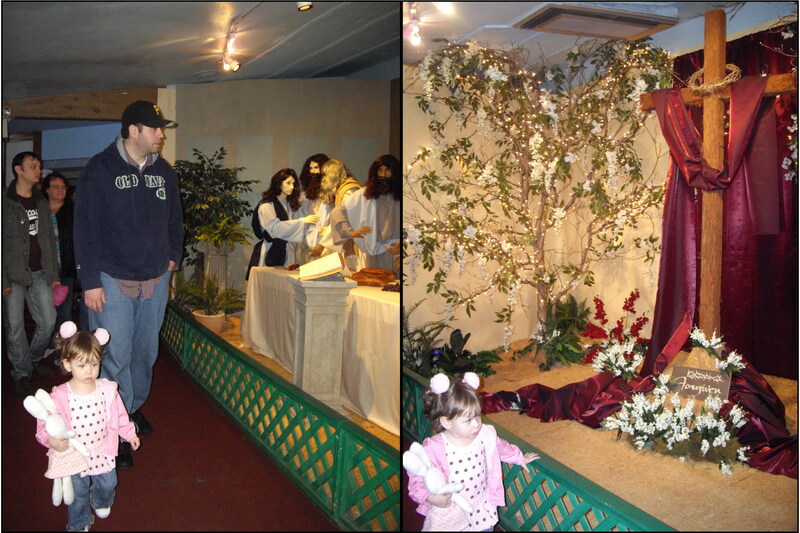 She liked the bunnies and pointed out “big” bunnies and what they were wearing and doing. The next display was the most popular among the toddlers that were there…Sesame Street. 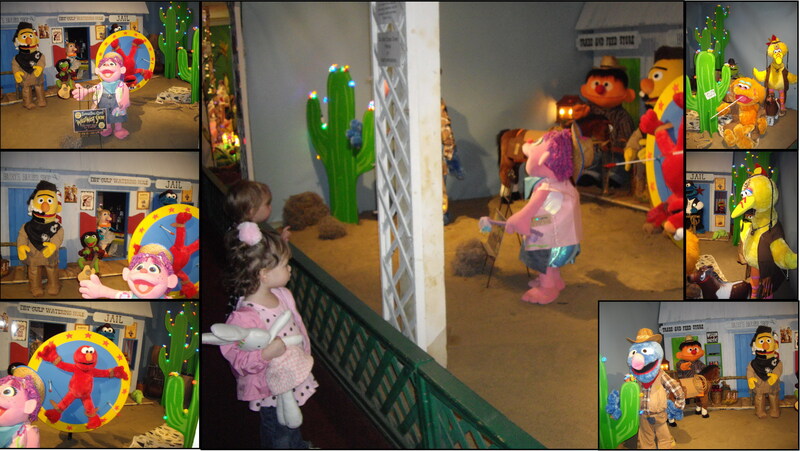 I’m not sure exactly what Sesame Street in the Old West has to do with Easter or spring, but the kids loved it. The wheel that Elmo is attached to was spinning. I find it a little disturbing to find a beloved Muppet strapped to a spinning wheel with the implication that someone was shooting arrows at him. The kids didn’t mind (sorry Elmo). Adaline loved pointing out and naming all of the characters and we had a hard time convincing her to go to the next display. 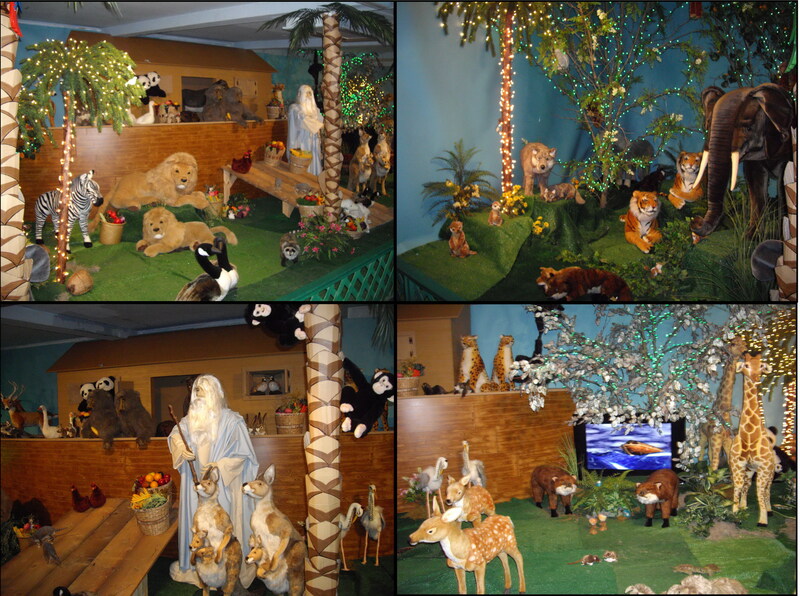 Adaline loves animals and she’s really good at naming a whole bunch of them so needless to say she love the Noah’s Ark display too. I’m not sure which animal was her favorite (I’m partial to the kangaroo with the animated joey popping out of the pouch 🙂 ), but she seemed the most excited about a barrel of apples that was towards the end of the display. Okay then. Still the bearded mannequins freak me out a little. Or maybe a lot. At the end of the display was the line to see the Easter Bunny, but they had just put up a sign saying that the Easter Bunny was going on a break. Fine. So I told hubby that we could walk around the store while we waited. This resulted in us spending a lot of money we hadn’t planned to spend. Oh well. 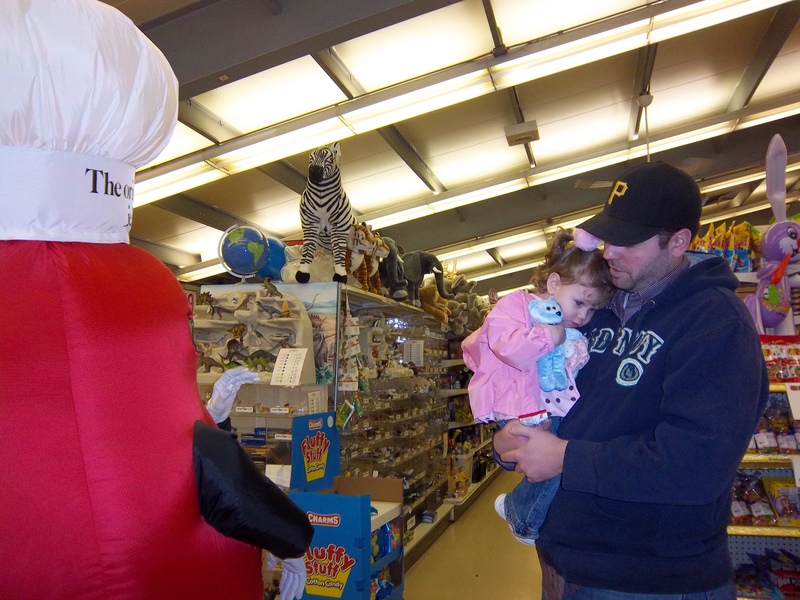 So, we started looking around and saw a person dressed as a big jellybean handing out…jellybeans (duh). Daddy was carrying Adaline and she seemed to like the jellybean and waved to it, but when I said, “Let’s take a picture with the jellybean” (with every intention of my husband being in the photo and not handing my daughter over to a giant candied stranger in the middle of a store), Adaline was suddenly scared of Mr. Jellybean and clung to her Daddy. She now didn’t want to be anywhere near the jellybean. Adaline loves playing the piano. 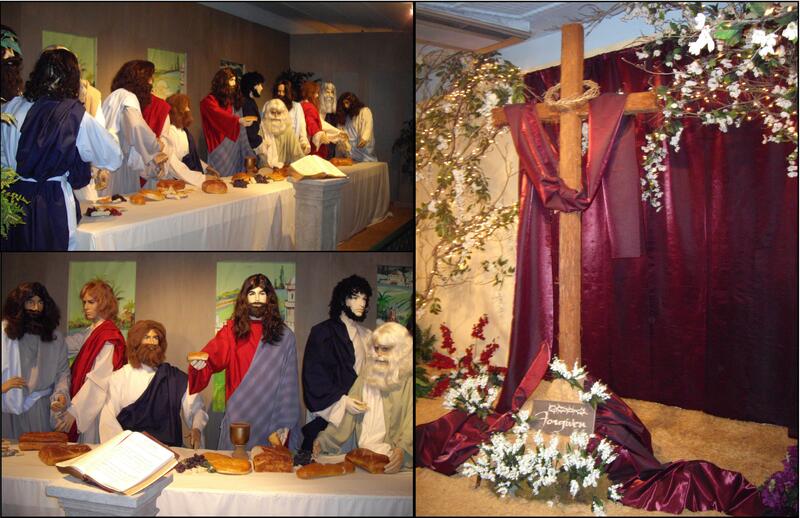 Eventually we go back to stand in line for the Easter Bunny. While we’re in line Adaline notices some bears on the other side of the rope that she didn’t notice when we’d left Bunnylane. 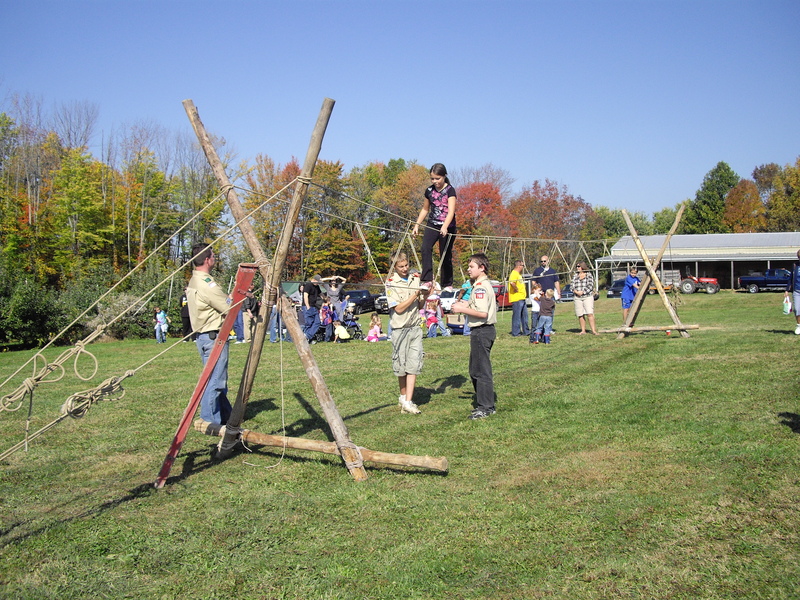 We cross the rope to go visit the bears. Adaline gives them hugs and kisses, but never long enough to catch a decent photo. Use your imagination. The whole time that we were shopping and while we were waiting for the Easter Bunny Adaline kept repeatedly asking for the ducky song. We told her we’d go see it again before we left. We were getting closer to the Easter Bunny and finally we were waiting there while a little boy was on the Easter Bunny’s lap. Suddenly Adaline cries, “Big Bunny!” and when I tell her we have to wait and hold onto her before she runs over into the middle of some other kids photo…she starts to cry. 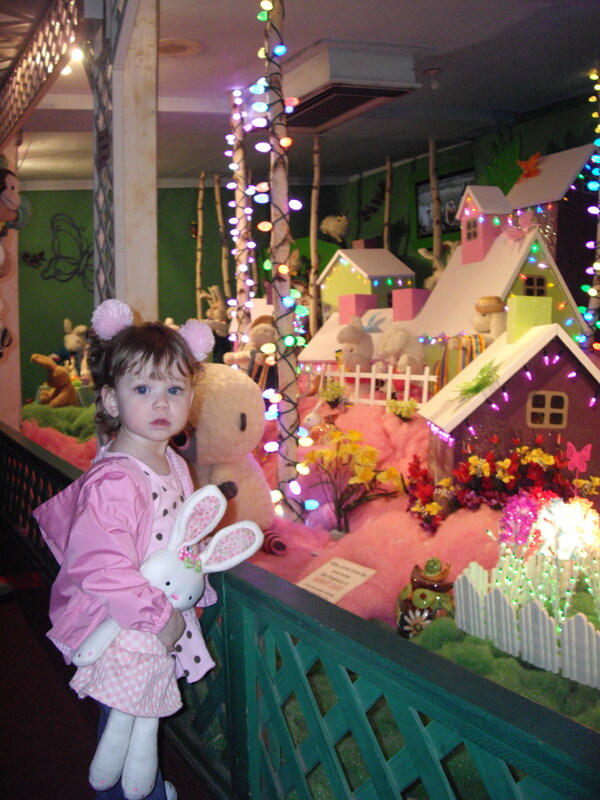 I’m thinking that other people probably think that she’s crying because she’s afraid of the bunny, but she wasn’t. As soon as the little boy was out of sight I let her walk up to the Easter Bunny and she asks, “Touch?” and I tell her that she can and then I say, “Do you want to sit with the Easter Bunny?” She says yes and I put her right in his lap! She got slightly nervous when the bunny moved his arm (I’m pretty sure she thought it was a stuffed animal prior to that), but she was fine and started poking the Easter Bunny in the eye. Nice. I told the girl taking the picture that Adaline wouldn’t smile, but that didn’t stop her from trying over and over again to get her to smile. Okay. 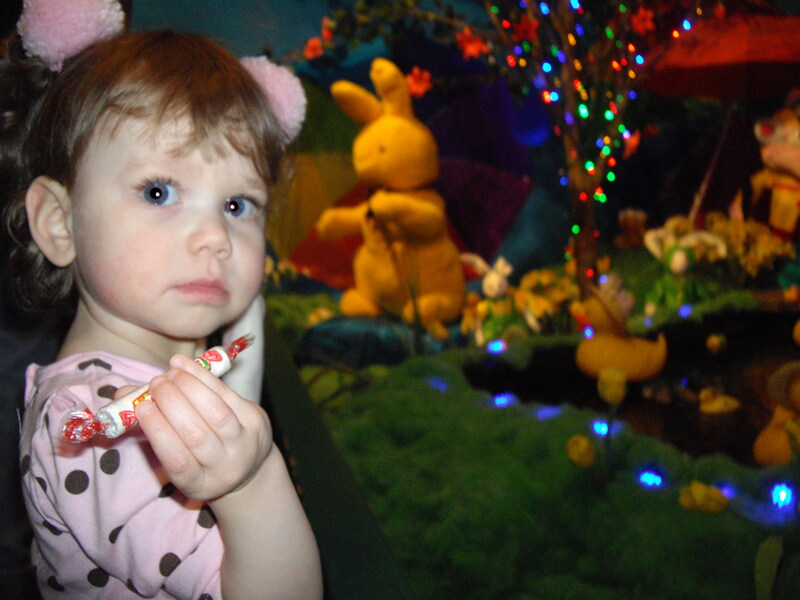 Then the Easter Bunny gave Adaline some Smarties. I have video of this entire exchange which I was going to post here and then after seeing that I appear about 8 times bigger than I actually am (or than I actually think am I), it grossed me out and I decided to leave that little gem for immediate family. Sorry about your luck. 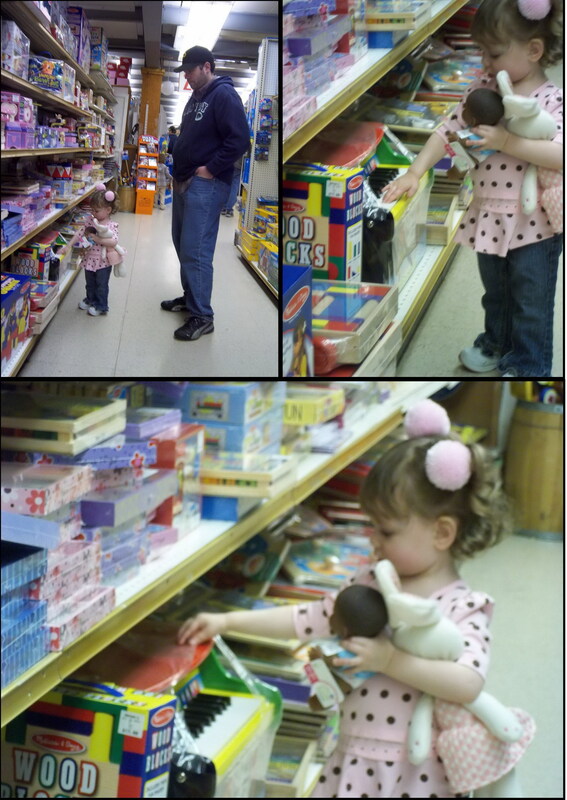 When we left the Easter Bunny I got into line to pay for our stuff while Hubby and Adaline got into line for Bunnylane. The line was long now, clear past the front door. By the time I was done with my purchase they were just approaching the Bunnylane entrance. Adaline was in ducky song heaven. It played over and over and over again and she stood there and stared at it and did a little wiggly dance that got a lot of ”awww”s from passersby. When someone else would dare to get too close to her beloved ducky display she would get upset and tell them “No! No!” Woah, there, settle down Princess NoNo the Duck Nazi…spoiled much?! Here is a cute little video of Adaline dancing to the ducky song. We stayed there for a good long time and let her watch the duckies and then I bribed her with chocolate to get her to leave. 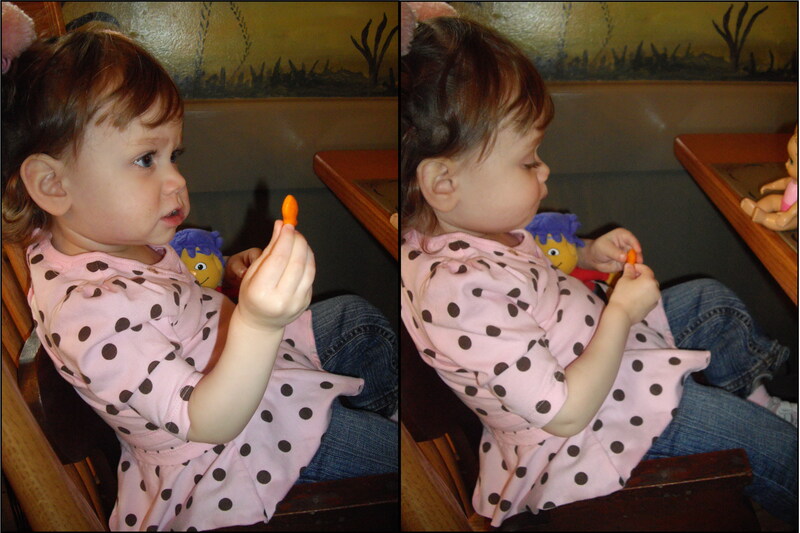 We drove away from Kraynak’s while Adaline happily munched on M&Ms and then Smarties from the Easter Bunny. It wasn’t raining anymore and we were hungry so hubby and I decided to swing by Volant and see what was going on there. 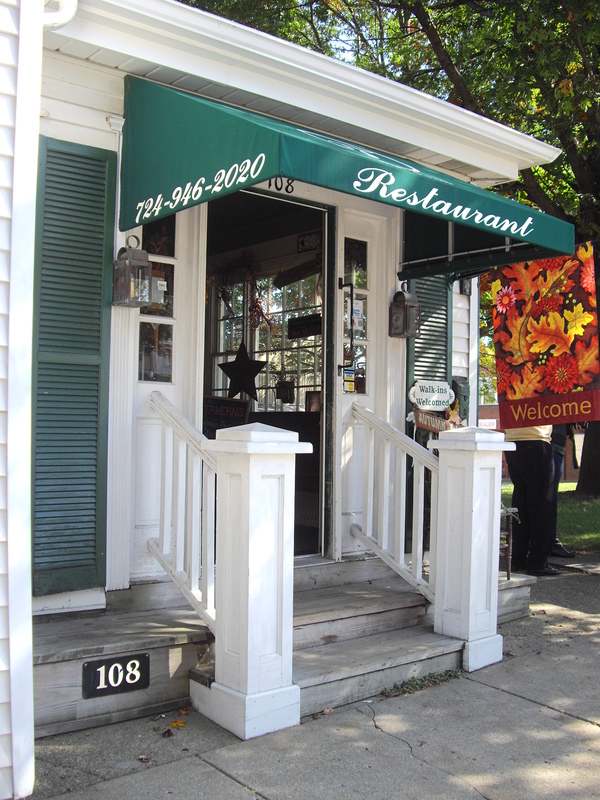 We decided to stop at a cute little restaurant, The Tavern on the Square, just outside of Volant, where we had stopped to eat when we went to The Apple Festival last October. Adaline was telling everybody about how she saw the Easter Bunny and he gave her candy and was wearing a blue bow and she poked him in the eye…and they thought she was adorable (maybe they would’ve felt differently had she poked them in the eye too). 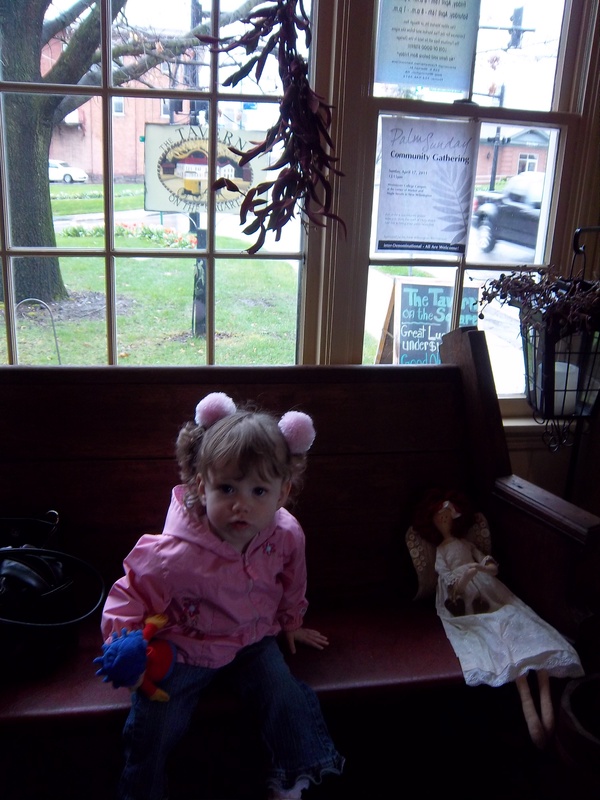 We had a nice lunch and Adaline was excited every time a horse passed by the window (attached to an Amish buggy). 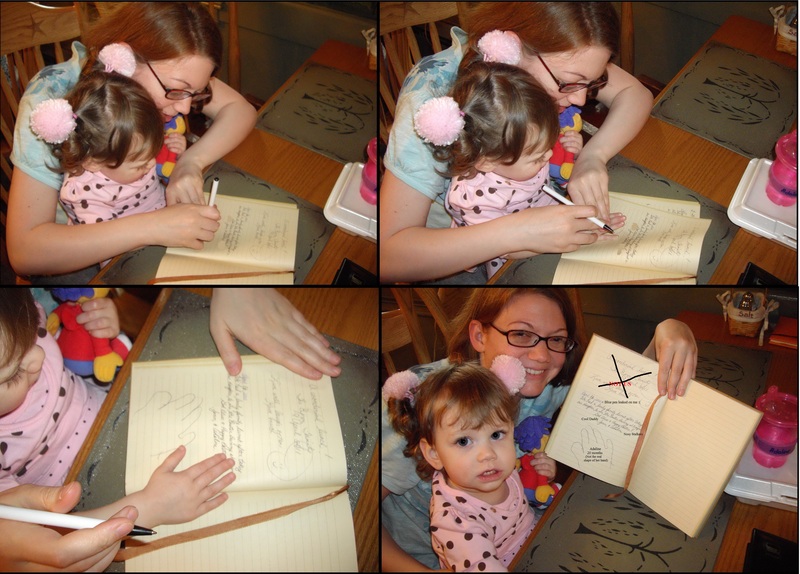 There were guest books at every table, so I decided to sign one and then trace Adaline’s hand and date it. She’s always excited about getting her hand traced until the pen has to go in between her fingers and then she scrunches them up and tries to pull her hand away. This is why most of her hand tracings look like she has swollen thumbs and webbed fingers. After eating we drove through Volant but it didn’t look like anything was going on there. We were too tired to walk in and out of the shops so we drove home. Oh, and then the people came by and gave me back my Mother of the Year Award thankyouverymuch. Welcome to The Festival of Festivals! 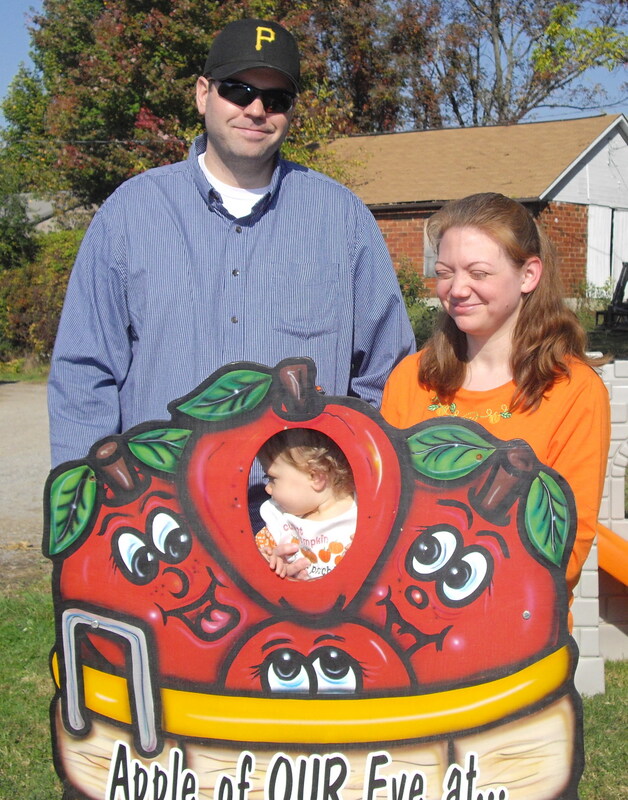 Last Saturday Cool Daddy, Adaline, my mom, and I headed out to The Apple Castle for their fall festival. When we first arrived we went to take a look around the store. It’s a small store so it was very crowded. We went to see the bees. 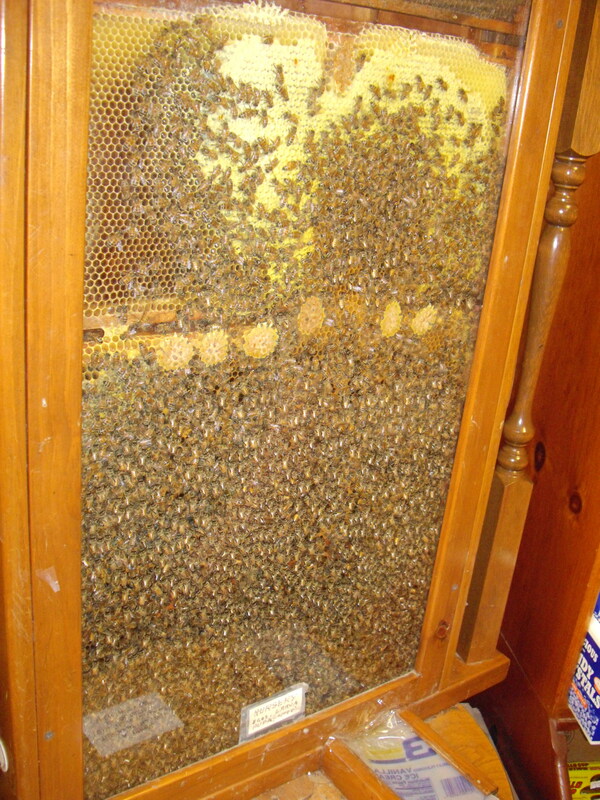 Since mom and I usually visit The Apple Castle in the winter this was the first time we really got to see the bees. There’s a hidden tunnel that leads to the outside so that the bees can come and go as they please. 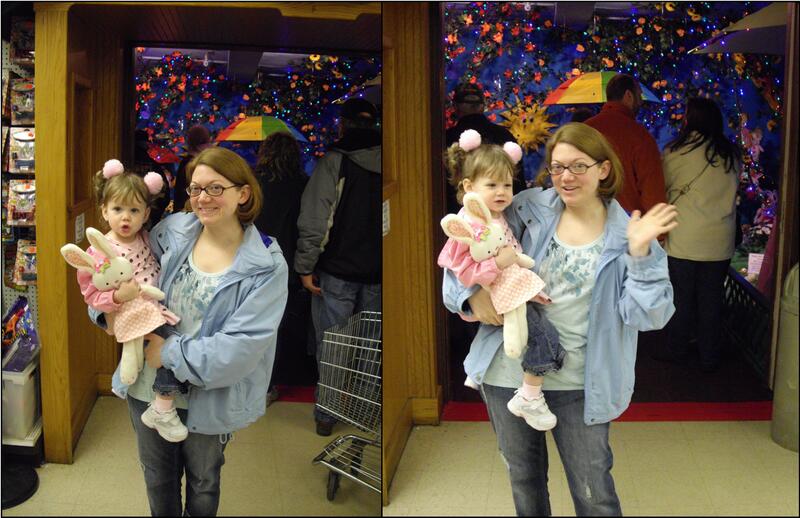 Adaline seemed to like looking at them, even though she looks bored in the photos. 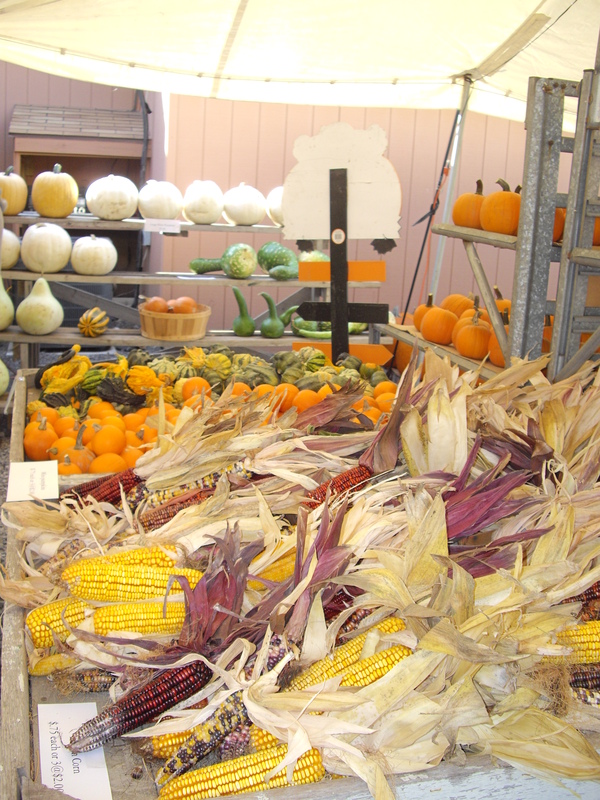 Right next to the store they had set up a tent with displays of pumpkins and gourds. 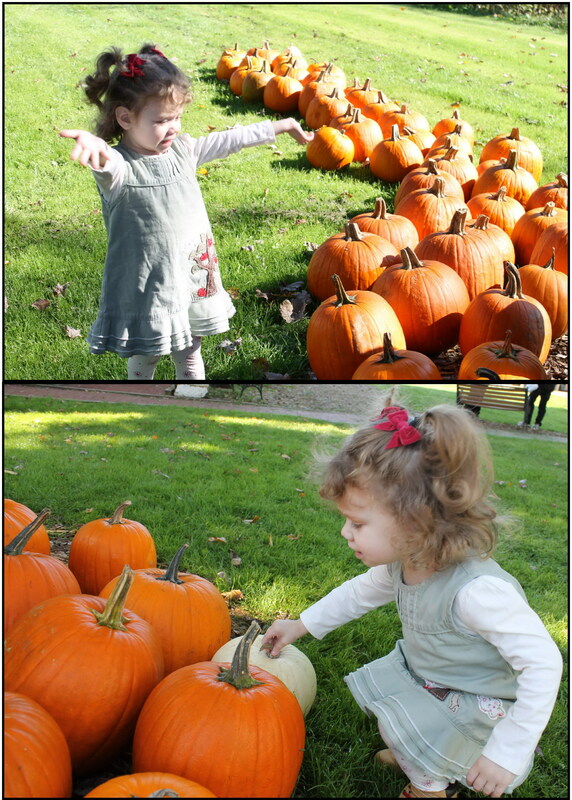 Once again Adaline was very excited about the pumpkins. Instead of calling them “balls” this time my mom managed to get her to say “pump”. Since then she’s went back to calling them balls. 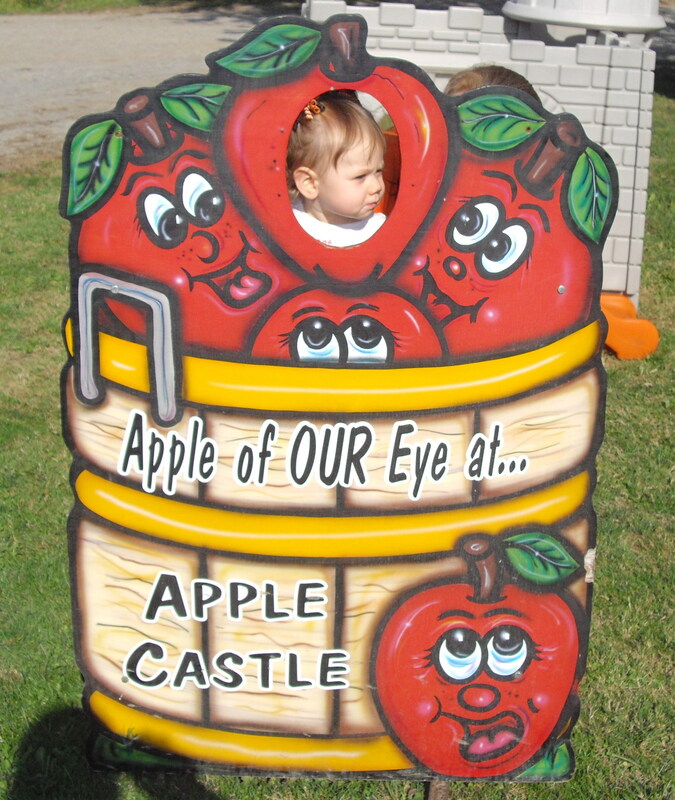 The “Apple of our eye” at The Apple Castle…awww! In front of the store they had a stage set up. We didn’t watch any of the performances but we did catch a glimpse of some ladies clogging in poufy skirts. Awesome. They also had medics and the fire department there. I’m not sure if they were there for emergencies, but they were giving the kids tours of their trucks, which I thought was pretty cool. 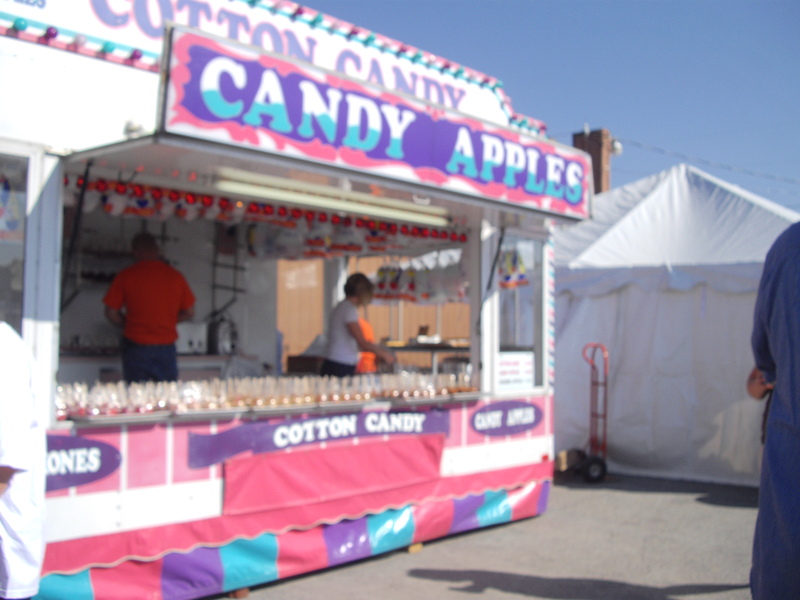 Next to the Apple Castle is a huge field where they had all of the vendors set up under tents. It wasn’t the best craft show that I’ve ever been to, but it was nice. 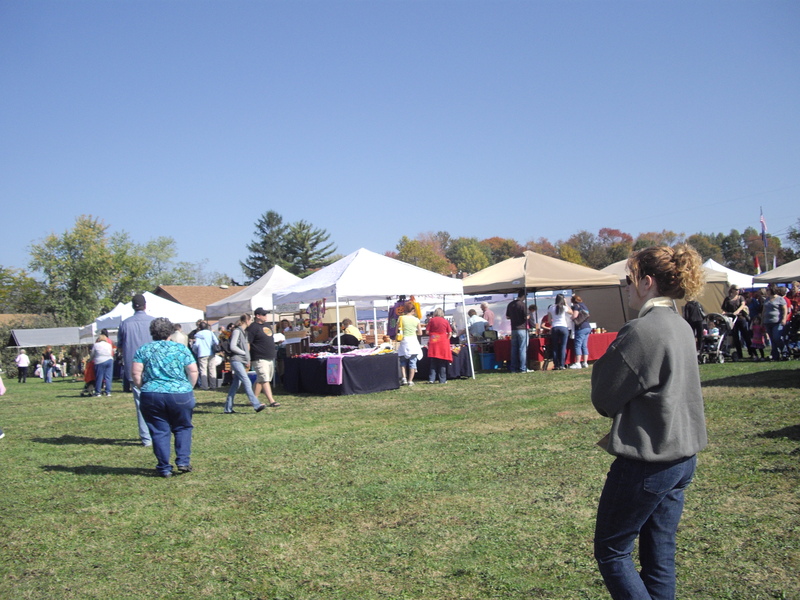 (If you want a really good craft show I recommend Christmas in the Woods…but you have to pay admission. Boo.) We found a couple of cute things for Adaline. 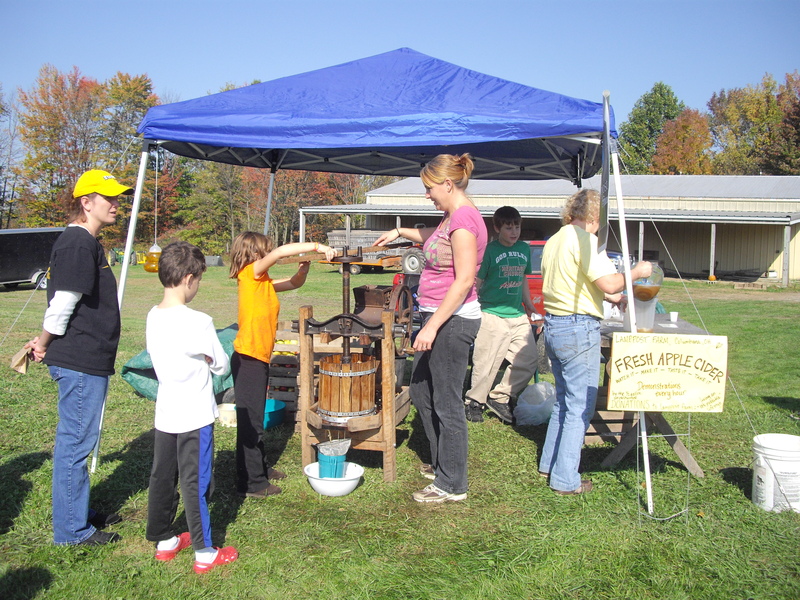 They had an apple press there and they were giving fresh apple cider demonstrations. I thought it was pretty neat and I would’ve volunteered to press the apples when I was a little girl. I would have tried some of the cider, but there were bees everywhere, so I kept myself away from there. And there was also this. Although we didn’t bother to get any because it was so hot outside. 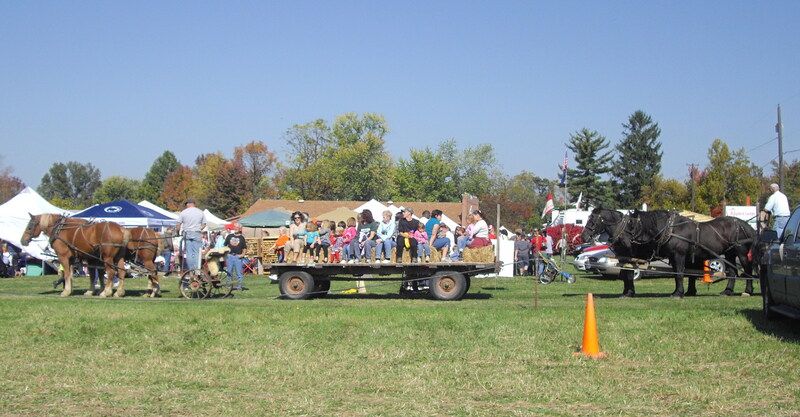 They had these horse and wagon rides, but we didn’t bother to ride them. It was just too hot out to go sit in a pile of hay with strangers. 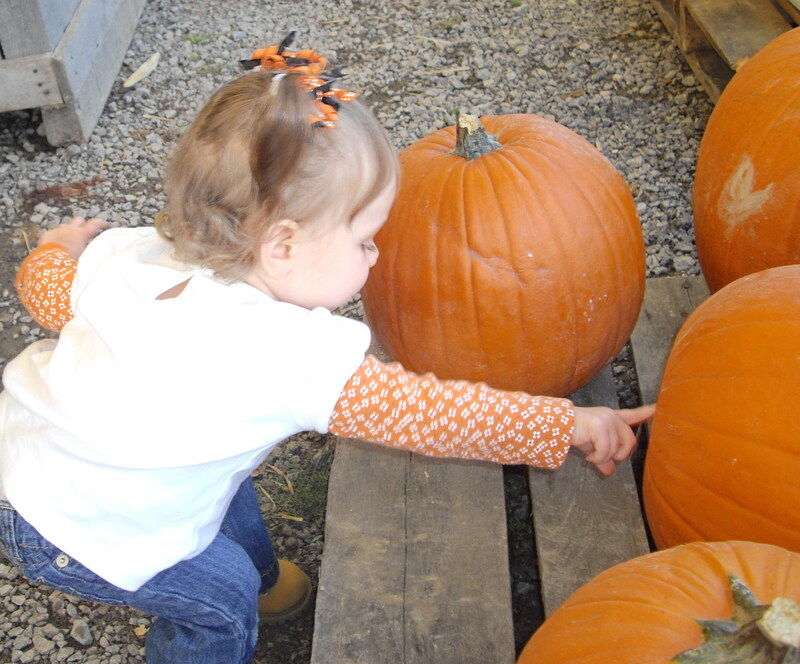 While my mom and Adaline went back to the car for a diaper change and to cool off in the air conditioning, Cool Daddy and I went back to the pumpkin tent to pick out a pumpkin. After that we decided to go. We had spent about 2 hours total at the festival. 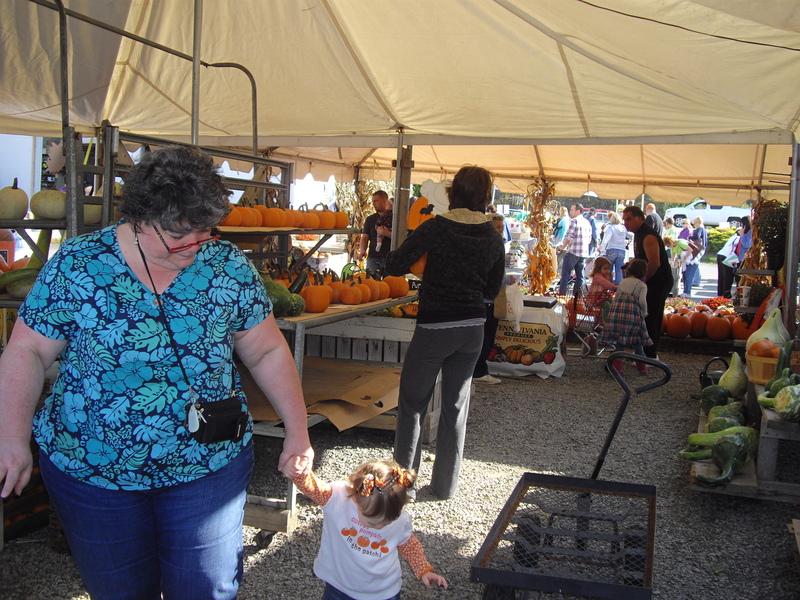 After The Apple Castle the plan was to go to the Volant Autumn Pumpkin Festival a little ways down the road. There really is only one place to eat in Volant, so I recommended we try a restaurant on the way there. We stopped at this cute little restaurant. I really liked it. It had the old fashioned country décor that I love so much. They were very busy so we were seated upstairs (where it wasn’t near as cute. Boo!). Adaline ate her food while we were waiting for ours and then she became obsessed with a stuffed lion that was on a set of bookshelves behind her. She would stare at it and point and say “Do Do” (her word for “dog”). It turned out to be a puppet…and oh do I love puppets. So I kept us both entertained until the food got there. At some point we noticed that Adaline was wet. Cool Daddy went out to the car to get the diapering stuff and then I waited for the bathroom to be available. I opened the door, stepped in, and stepped right back out. Not only was there no baby changing station, but there was barely room enough in there to change your mind. There was a sitting room area behind our table where there was a leather sofa that no one was sitting on. I decided that I would change her on the sofa. I couldn’t get to the room because someone was blocking the way so I decided to go out of the room and go in the other door. When I was doing that I noticed a whole other dining area that no one was at and so I put the changing mat on the floor and changed Adaline’s diaper in this pretty little tea room. It was very uncomfortable because I was kneeling on a wooden floor and it really hurt my knees and I was wearing big hiking boots that made it difficult to bend my toes. Adaline really wanted to get up and I was worried because there were two sets of stairs with no baby gates. Needless to say it was quite an experience. As if that wasn’t bad enough right before we left she got an even dirtier diaper. Thankfully the entire upstairs had left and we were able to change her on the leather sofa. Despite the whole diaper debacle I found the restaurant quite charming with good food and I would really like a chance to dine on the first floor to see what the atmosphere is like down there. So here are some completely underwhelming photos of traffic. Take this times about 20 to get an idea of how busy it actually was down in the hub of the whole thing. Oh yeah. 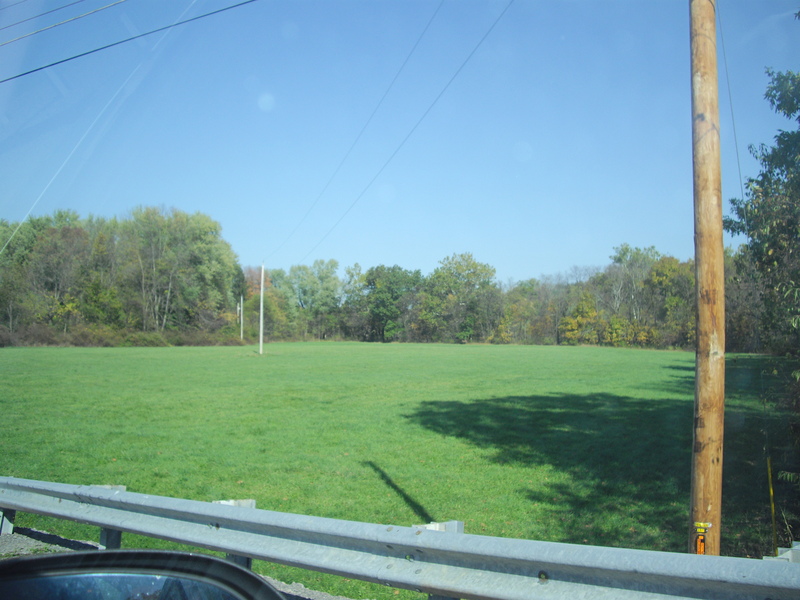 That looks like it might be a big ole field right next to that there covered bridge. Oh, vague memory of strange detail, we win again! 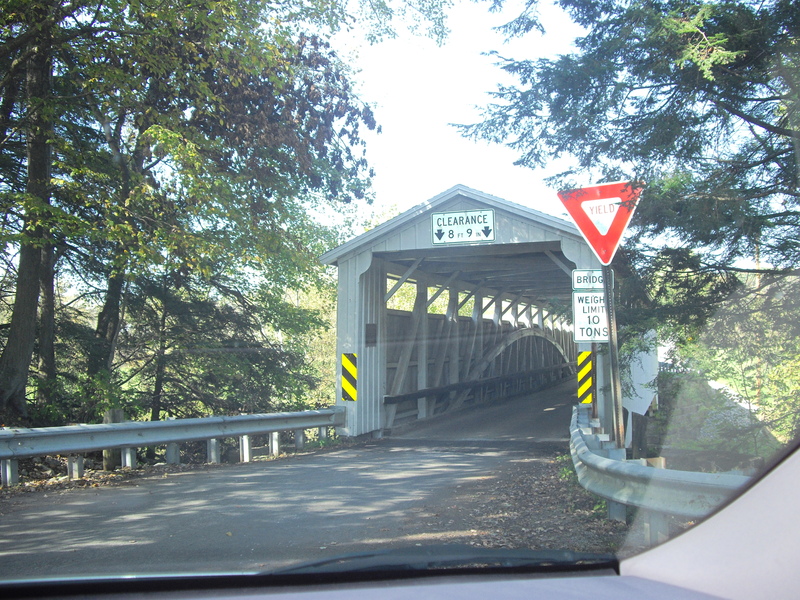 Now that we’re done hunting for covered bridges we are really on our way home. 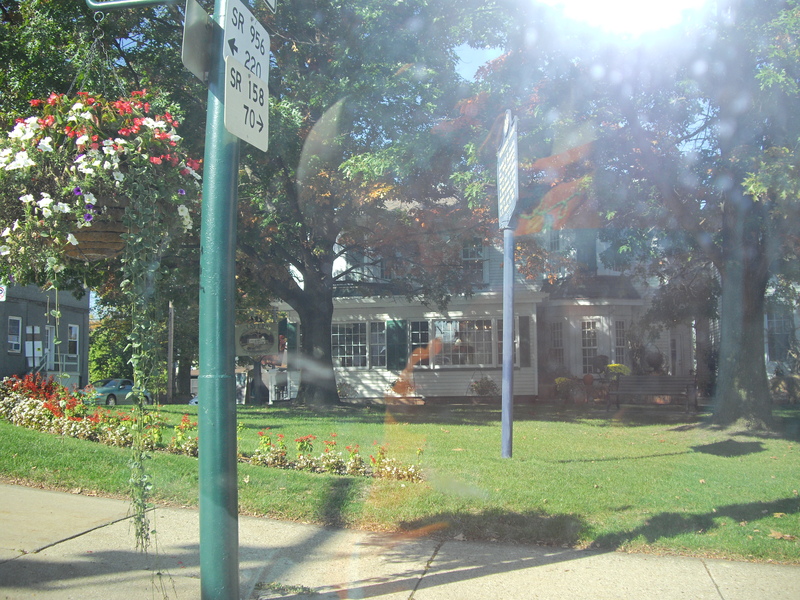 We pass the restaurant that we ate at and I take a picture of the front of it through the window. Hang on, there’s a really uninteresting story behind the photo and you really don’t want to read it, but I’m going to go there anyway. So here it is: When we were leaving the restaurant I wanted to take a picture of it. 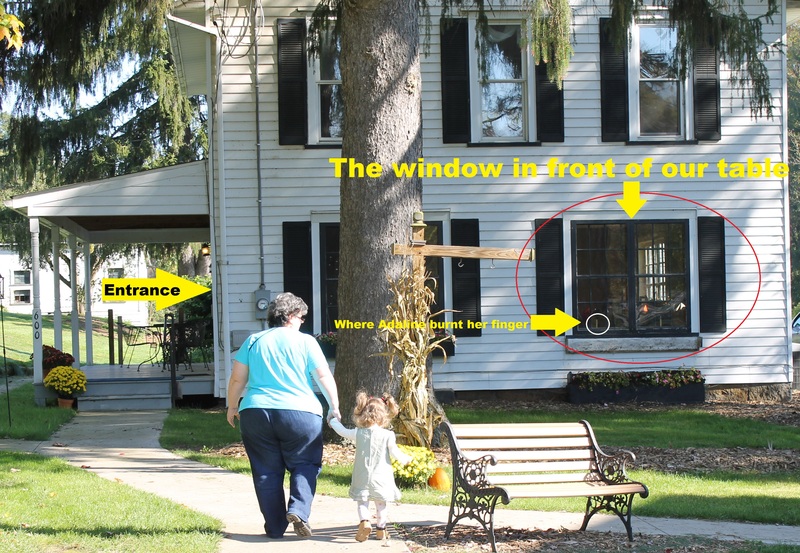 I was explaining to mom and Hubby that when you mention something in a blog post, people like to have a visual of it. I got a picture of the entrance which I posted earlier, but I was unable to get a photo of the front of the building. There was this group of people that I assume were related to one another. There were probably about 10 of them and they all had cameras around their necks and they were taking pictures of each other. In fact, they were so engrossed in their picture taking that they didn’t even bother to close the door to the restaurant…so I went back and shut it. They were all over the front of that lawn. I can’t blame them. I would’ve done the same thing if I was having some sort of family get together. Oh wait, I was having a get together and trying to get some pictures but I couldn’t because The Family Von Takealltheroom was hogging the space. But seriously, it’s okay because it really seems like this is the first time these people had gotten together in years and I loved that fact that they were getting so many photos of their family together. I’m the same way, so I totally get it. Yummy bread from The Apple Castle. And here’s everything we got at The Apple Castle that day minus our big pumpkin (which was outside when I took this photo) and the loaf of bread we’d scarfed down. 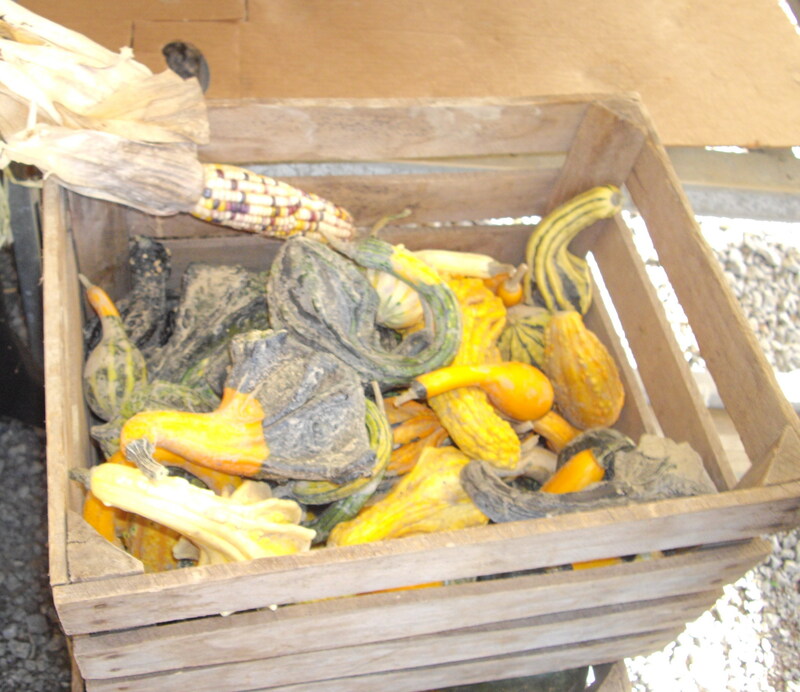 I got some fun gourds and mini pumpkins and pretty Indian corn. Not for any particular reason, just because I thought they were cute. We also picked up some apple cider (Duh! And also…yum!) 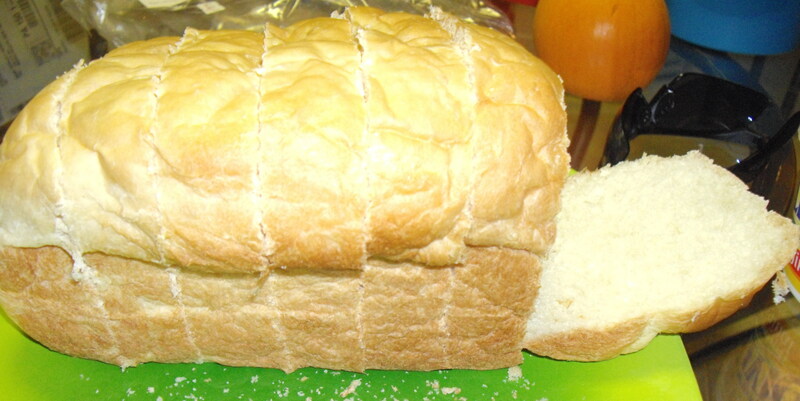 and of course the homemade bread. We got Adaline some adorable hats that she’ll probably never keep on her head. We were trying them on her at the booth and everyone just raved about how cute she was. The vendor even commented that she should keep her there to help her sell more hats. 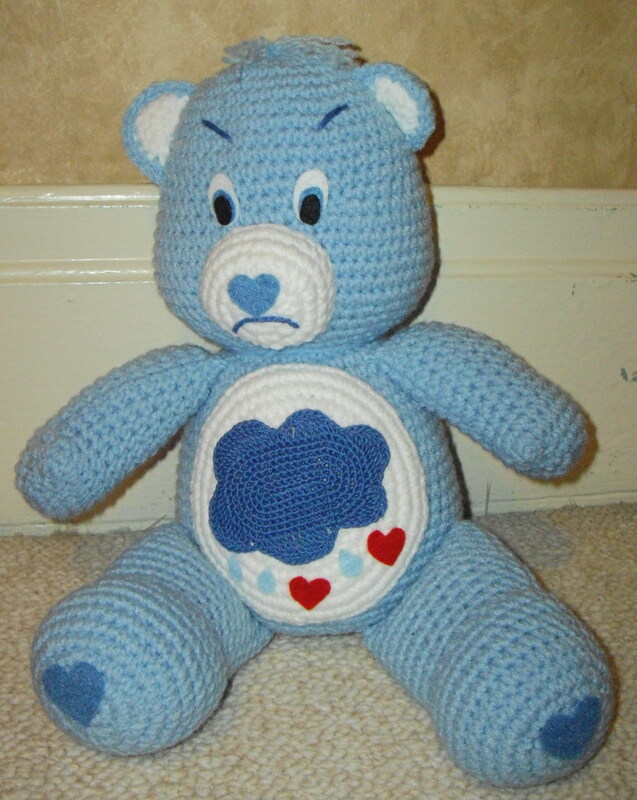 I absolutely adore the hand crocheted Care Bear. It was only $15! If I had known at the time that we wouldn’t be going into any of the Volant Shoppes, I would’ve bought more of them. 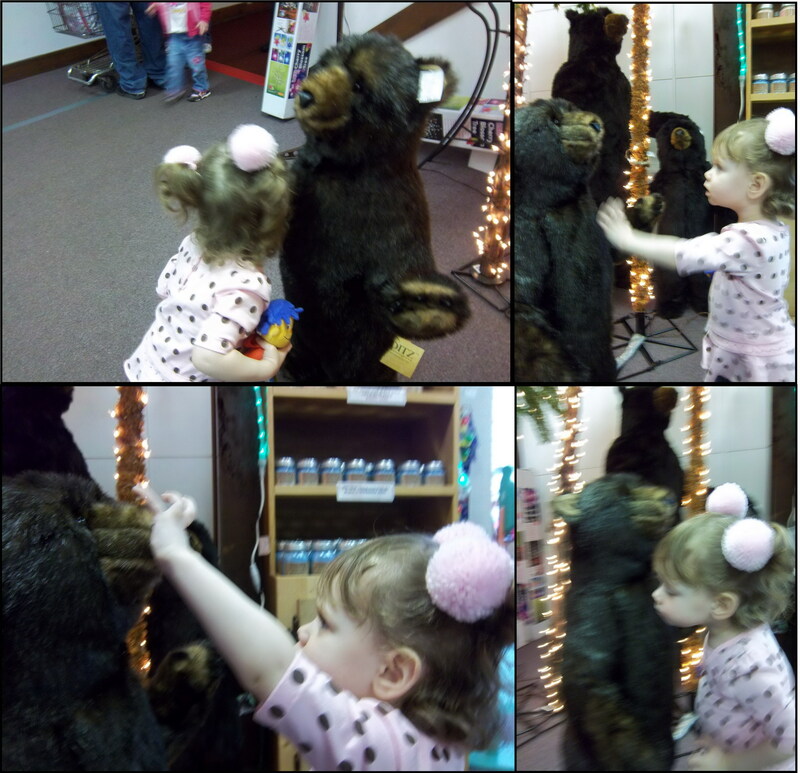 We tried several different bears and animals, but Adaline kept going back to Grumpy Bear. I said that it’s because it reminds her of her mama! The ladies at the crochet booth had a little Chihuahua there with them. Adaline was so excited to pet it and say “Do Do! Do Do!” I wish I would’ve asked these ladies if they had a card because their crocheted animals were so charming and reasonably priced, I think I would’ve referred all friends and family to them for any and all of Adaline’s future stuffed toys. I wished they had a Cheer Bear Care Bear available…I would’ve bought it whether Adaline wanted it or not. Cheer Bear was the one I had as a child and I have no idea how or why she got replaced over the years. That’s definitely one of the toys I would’ve chosen to keep. It would’ve been great to “replace” her with a handmade crocheted version of her. Oh well. So there you have it. All of the painfully dull details. Despite my drab story we really did have a nice time. 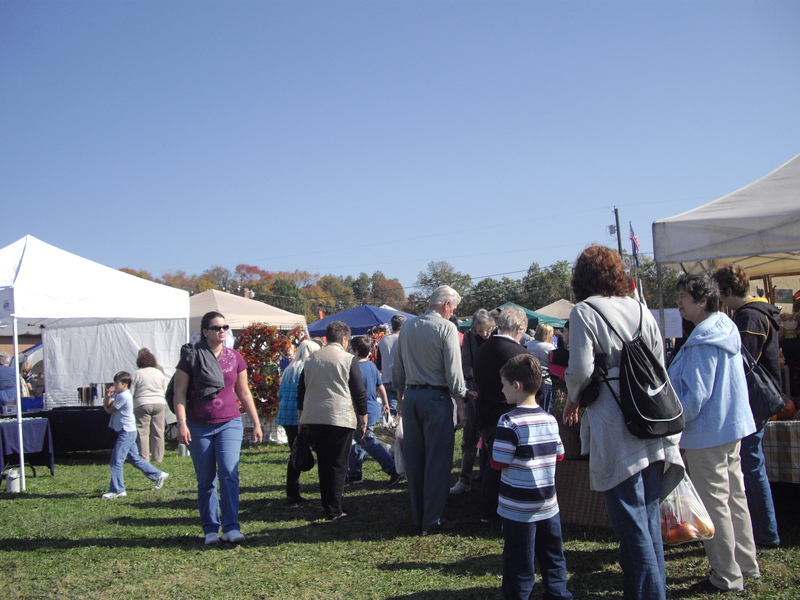 I think we wouldn’t mind returning to the Apple Castle Fall Festival and Craft Fair again next year. Check out our trip to The Spring House! 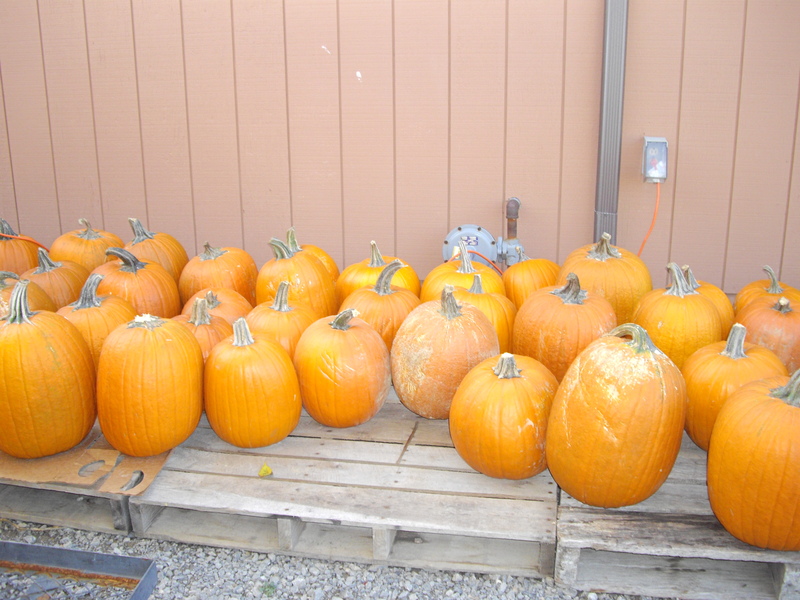 Be sure to stop back to read about our trip to Hozak Farms that we took on Columbus Day! October is a great month here in the beautiful state of Pennsylvania. If it’s not too rainy, the weather is lovely and the fall foliage is awesome. meet my daughter who had just turned 2 months old. We had a great visit. 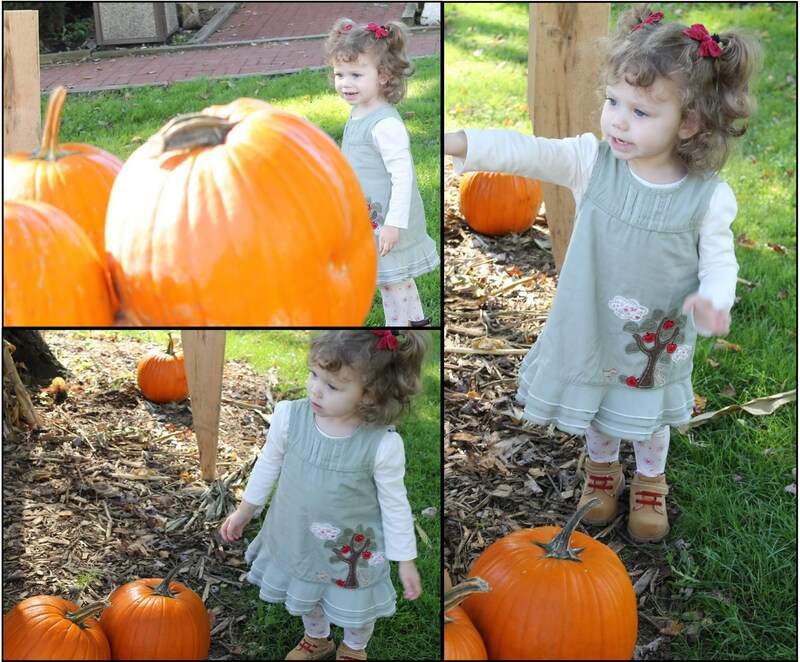 The same day that they left to go back home we decided to go out for some fall family fun. 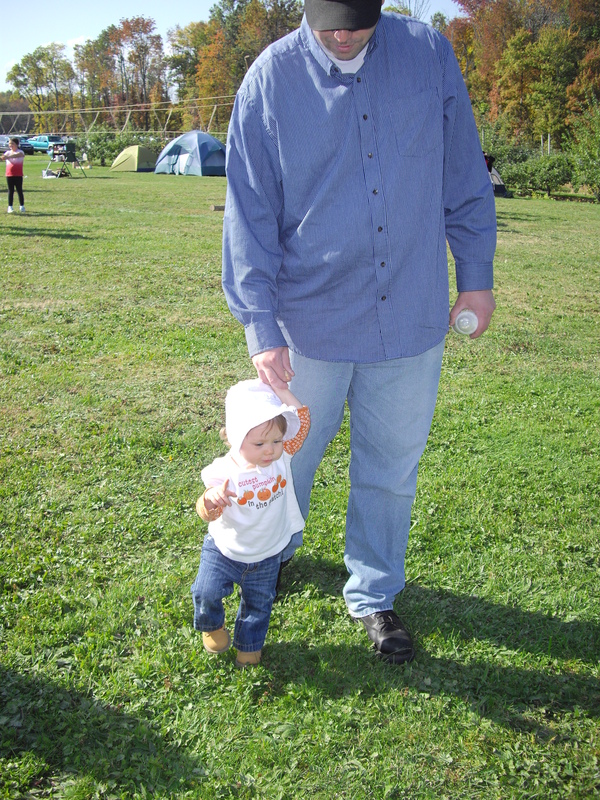 First we went to the Bridgewater Pumpkinfest. I’m not sure that I can really describe it. There wasn’t much going on at all. There was a “maze” that consisted of a few bales of hay. I don’t recall there being much there to eat. There were a few vendors there, but nothing that really interested me. 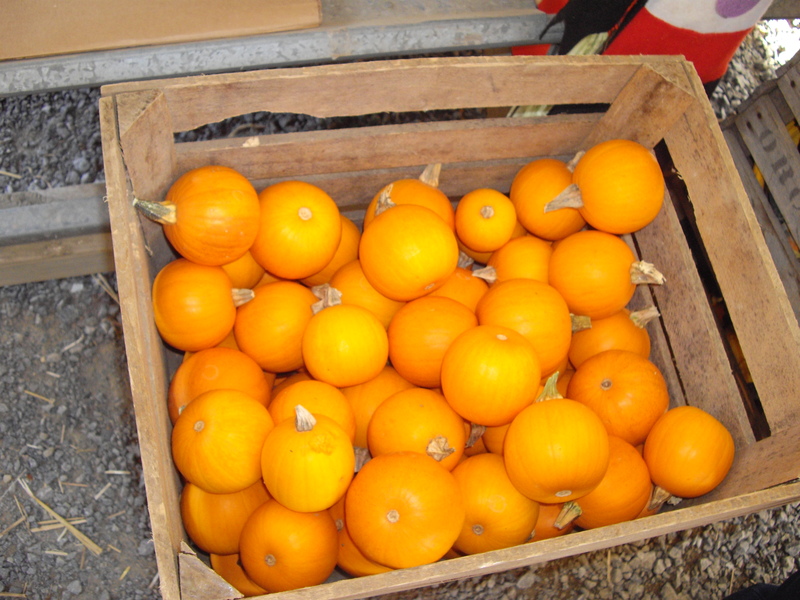 They did have a pretty nice wagon of pumpkins, but it’s not hard to come by a nice pumpkin around here. I never thought about taking photos of what wasn’t going on. All in all I’d have to say that the Pumpkinfest was not very festive. But we had a great time making fun of it after we left (because we are mean people like that, but it works for us). 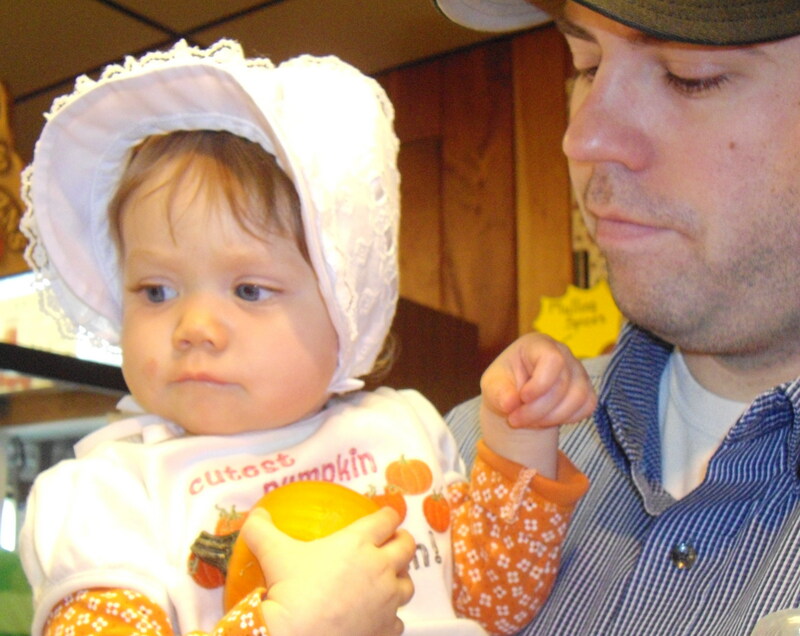 We shant be attending the 2010 Bridgewater Pumpkinfest…it was just too much excitement for us to handle (as you’ll be able to tell in the many photos of Adaline yawning and crying). The following photos were taken by my cousin, Seth. He’s an awesome photographer (he might’ve taken some photos of you if you were ever at Epcot). Adaline wasn’t a very willing subject. Oh well, a learning experience for us all. On the way home from the ever-so-exciting Pumpkinfest we decided to stop at a local park/hiking trail so that Seth could get some pictures of the fall foliage. The following photos are actually all mine (I have a junky camera…sorry), but the two of me and Cool Daddy together are Seth’s photos. My dad used to take my sister and I hiking here a lot when we were little (Click here to read a story about one of our hiking trips. I know that it’s a birthday post, but trust me, the hiking story is in there.). After going to the Pumpkinfest and the park we returned home where we said our goodbyes to our family and they left for the airport. 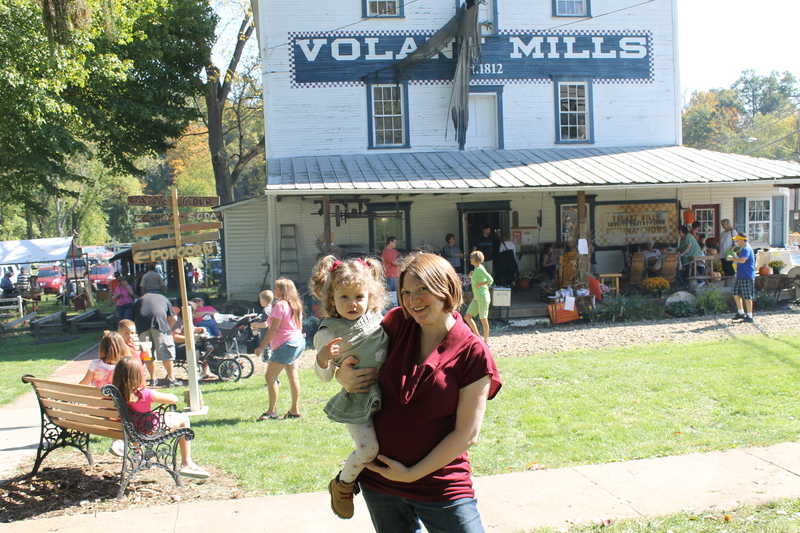 We then decided that we should venture out to the Volant Autumn Pumpkin Festival in Amish country to try to satisfy my fall fun appetite. So Cool Daddy, Adaline, and I went to Volant with my mom, his mom, his sister, and her boyfriend. There was actually stuff going on at Volant and there were people there too! We went in and out of the shops and stopped to eat, but that was about it. There aren’t too many festivities that you can join in with a 2 month old, especially one that’s tired, cranky, and spent the earlier part of the day dressed as a monkey. 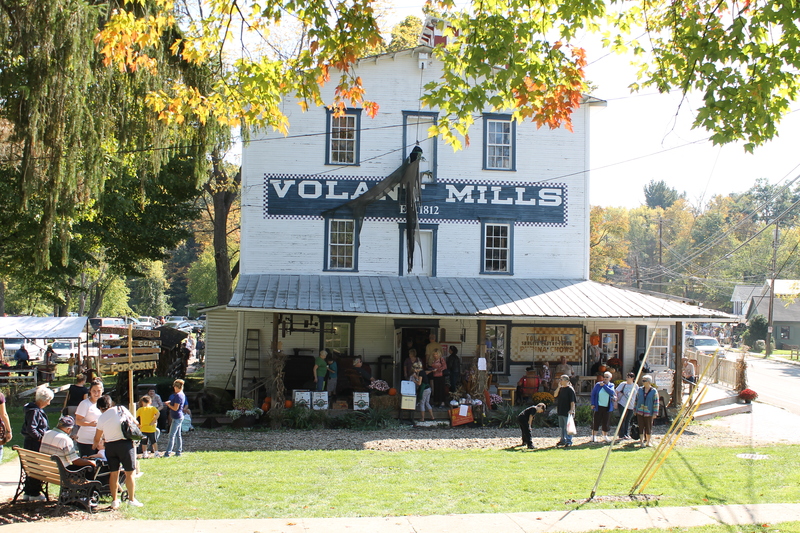 We had a nice time and we shall be returning to the Volant Autumn Pumpkin Festival again this year. 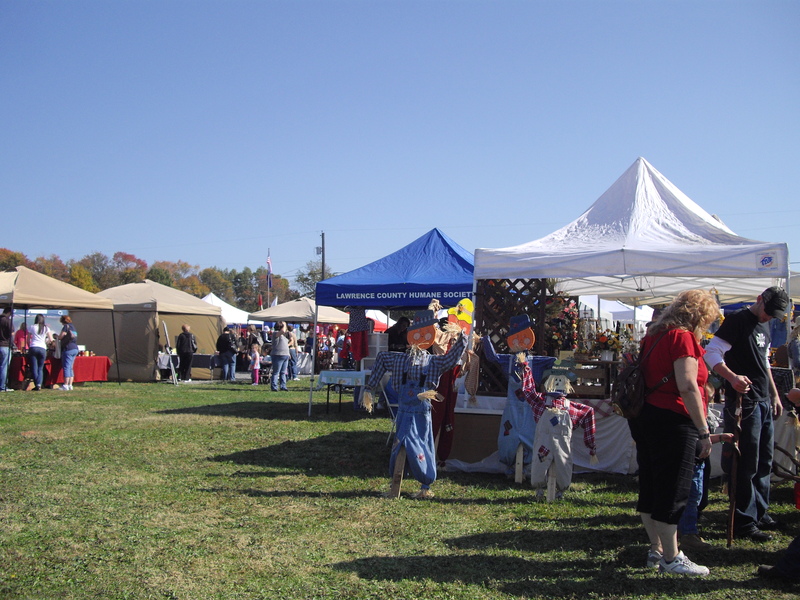 We’re also going to include a stop to the Apple Castle Fall Festival and Craft Fair in New Wilmington this year. 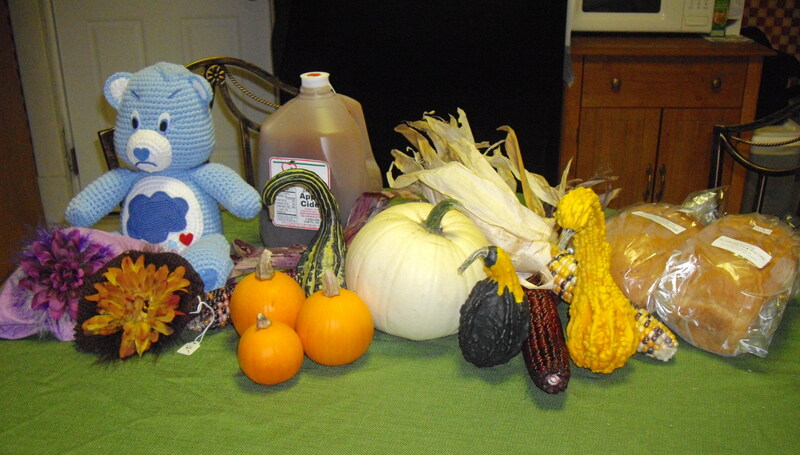 So that was the extent of our fall festivities last year. This year we have too much a lot more planned. I’m excited about it. If everything works out (Cool Daddy’s work schedule + weather + cooperative baby) we’ll be going to a lot of farms that we’ve never been to before. Be sure to check back here on the blog this weekend (or the beginning of next week) when I begin a new weekly series “The Festival of Festivals” for the month of October. 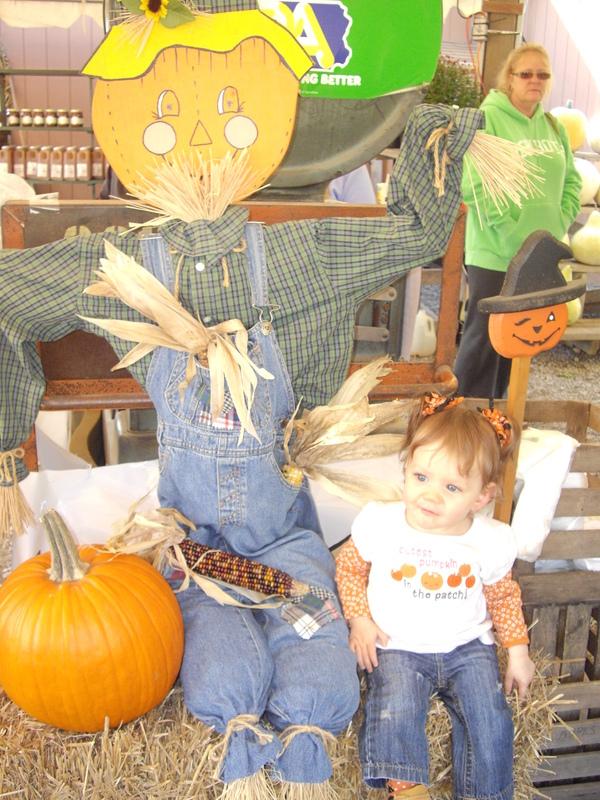 I just love hearing about other family’s traditions, so be sure to share your fall plans in the comment section!